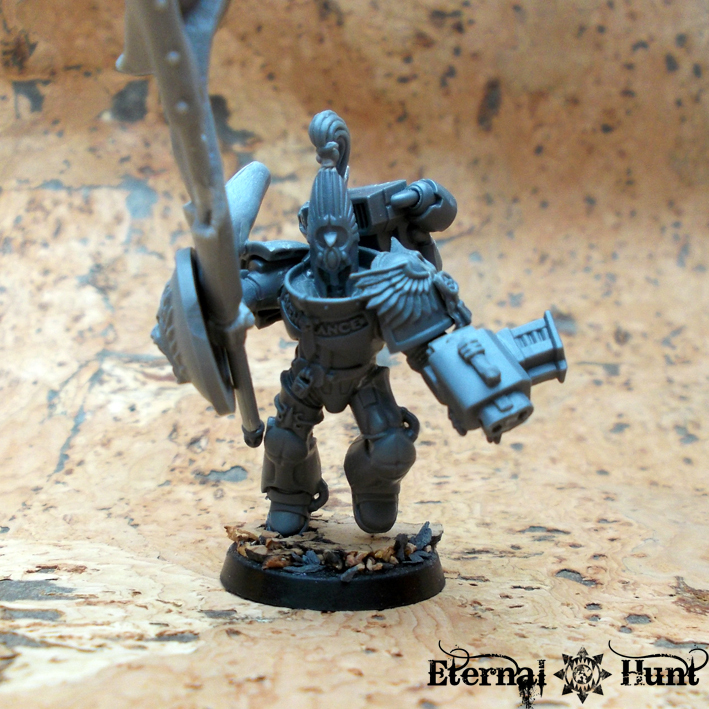 I used some leftover Terminator armour plates for this task, and I have to say I rather like the added bulk! 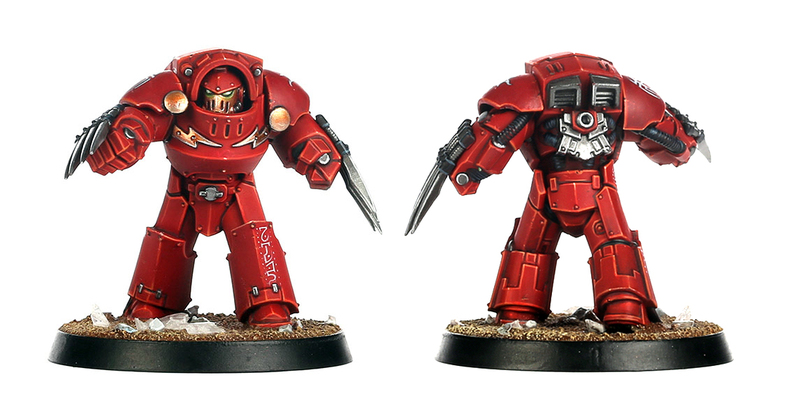 And while I was added, I could not resist replacing the left shoulder pad with a studded one from the Sternguard kit, mirroring the studded leg armour on that side — in fact, I should probably have done this from the get go! 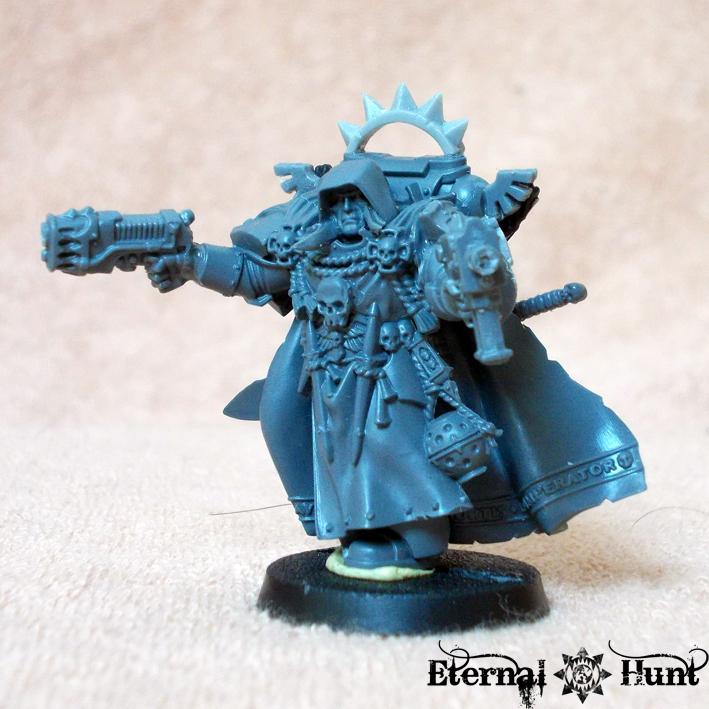 Just some small changes, admittedly, but they help me homing in on what I want the finished model to look like! I should have known before that converting my own version of Cypher wouldn’t be the actual end of this particular project. 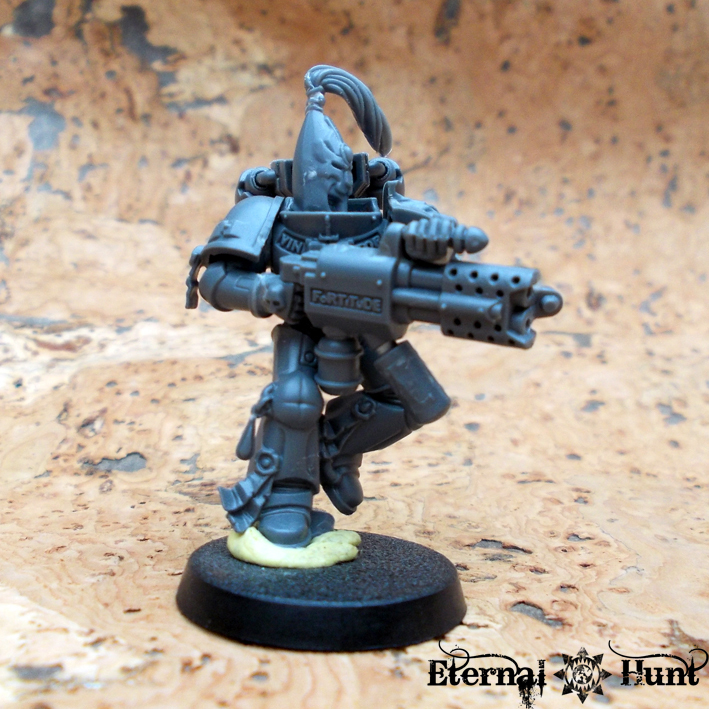 As a matter of fact, it only took a small remark from fellow hobbyist ghosty over on Dakka to provide me with the urge to kitbash some additional Fallen Angels — stupid hobby ADD! 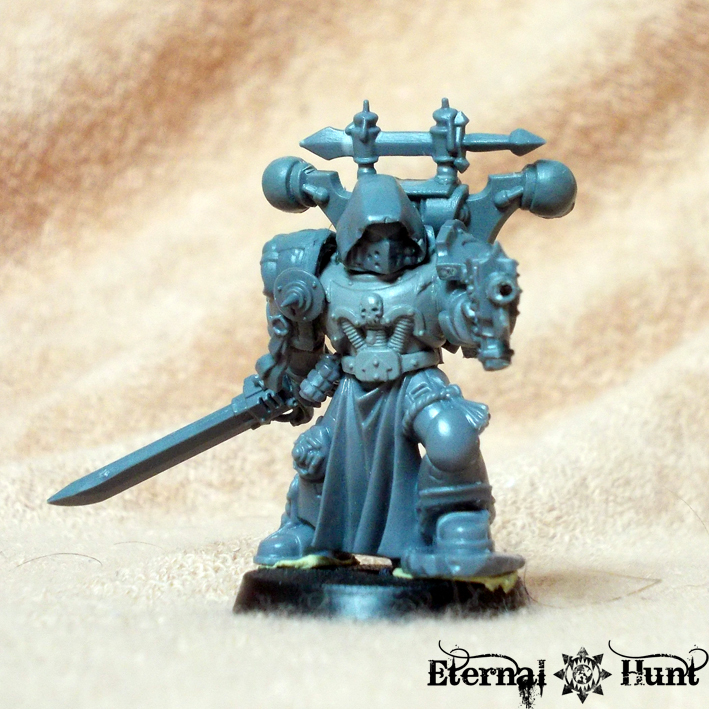 This first model was built from the DA Sergeant that came with Dark Vengeance. 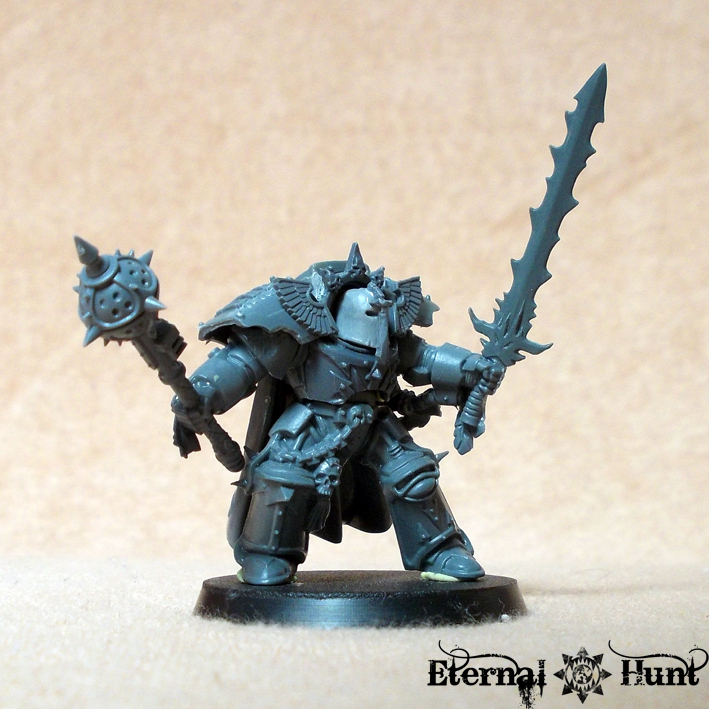 I simply replaced his weapons and head and added some additional bitz and bobs. One thing that was important to me was that these guys’ allegiance was supposed to be somewhat ambiguous. 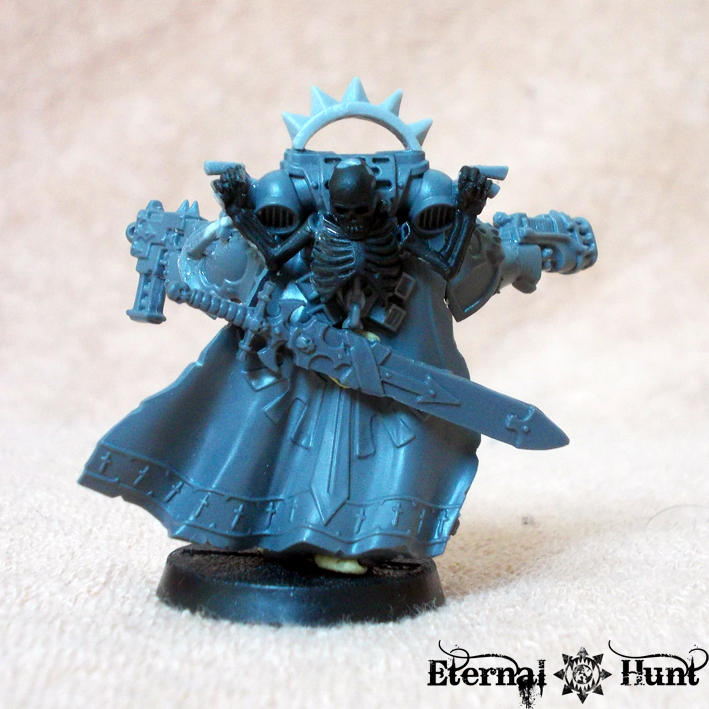 Yes, they are more ragged and more sinister than your average Dark Angel, but even if they are followers of chaos at this point, it’s out of necessity rather than conviction. 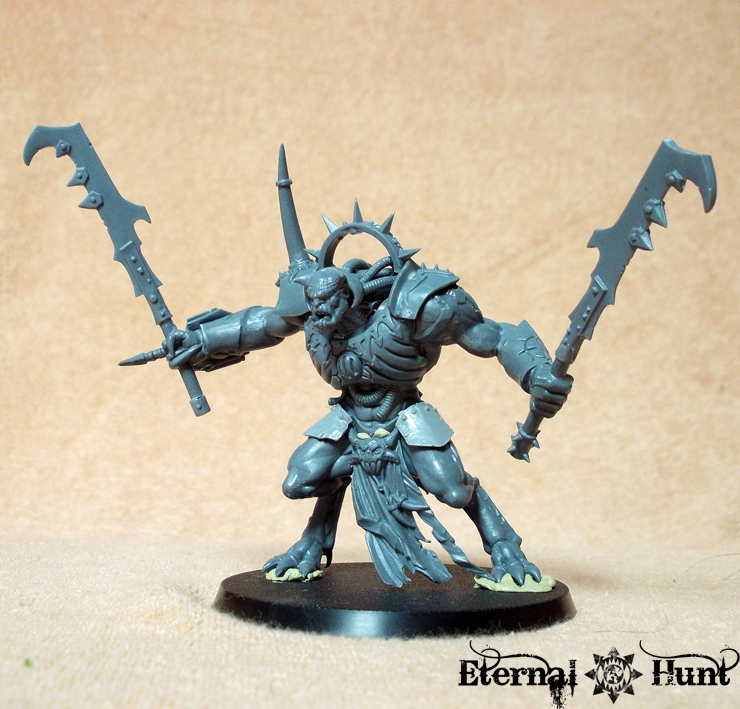 That’s why I restrained myself when it came to adding chaotic and spiky bitz. 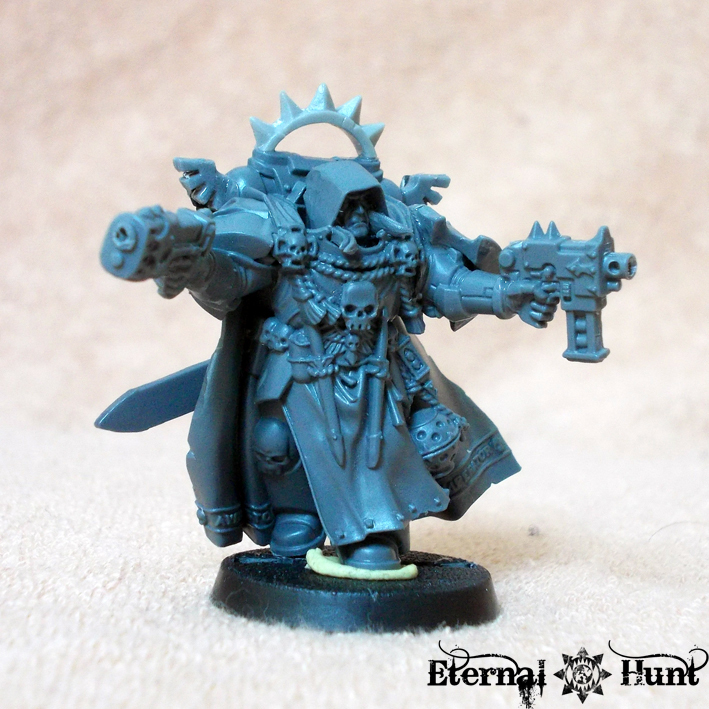 They’ll also fit together nicely with my Cypher conversion, I believe. 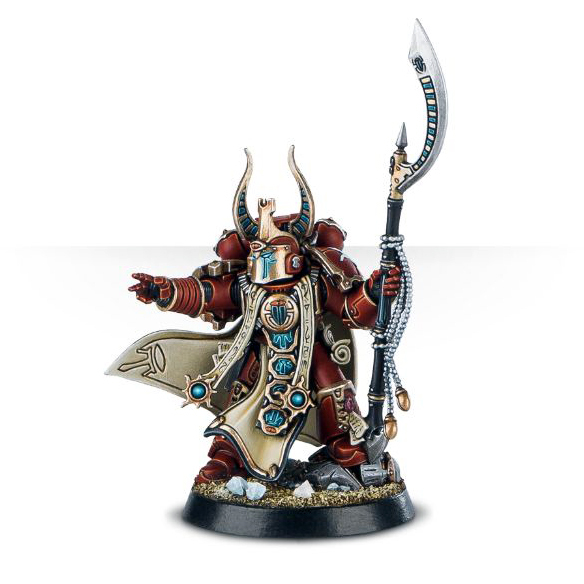 Granted, the huge daemon sword is a bit of a giveaway, but again, I like the idea that this is a weapon that the Fallen picked up by necessity rather than inclination. I also have to admit that the helmet remains a bit of an experiment at this point — feel free to let me know what you think! 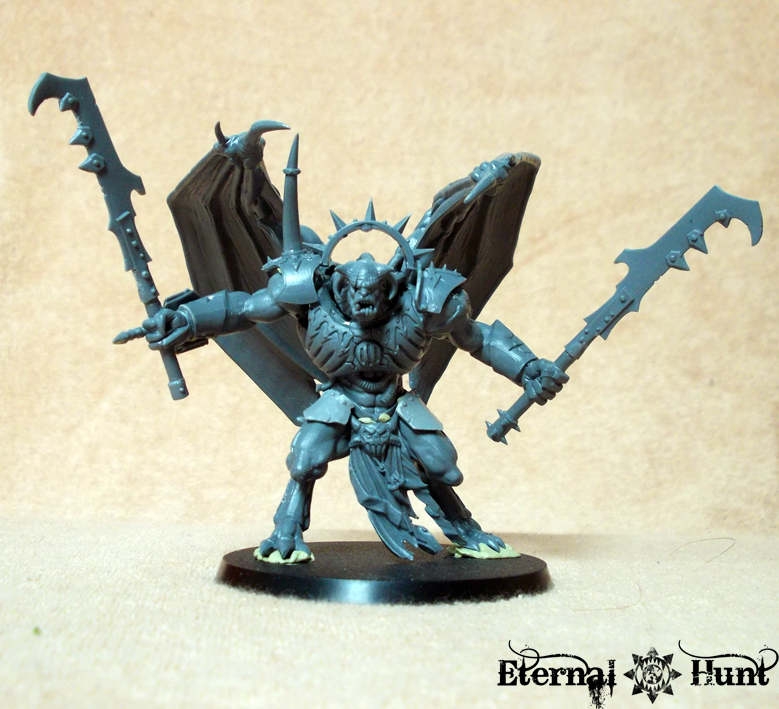 Some more work went into my World Eaters Daemon Prince, in order to tidy up the conversion a bit. I am pretty happy with how that turned out! 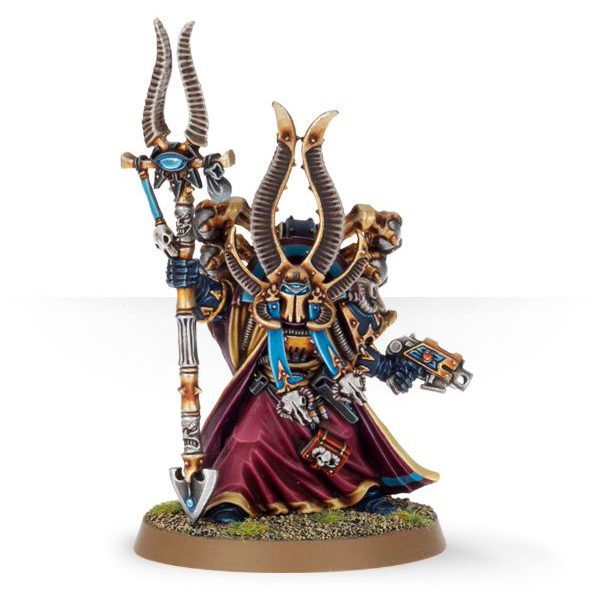 And to be perfectly honest with you, I really rather like the bulk and presence they add to the model — what do you think? 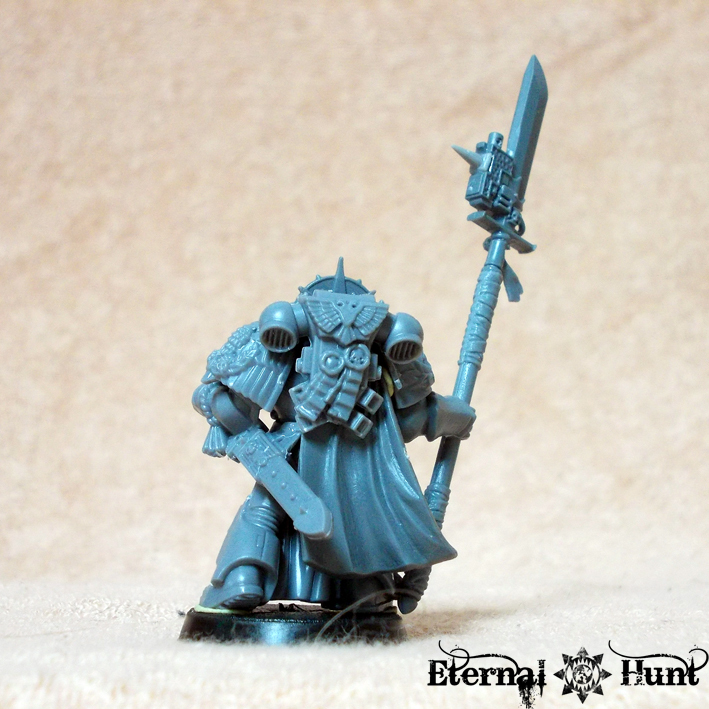 Even though it’s only a Space Marine based kitbash, I believe most of the visual cues are there to make the model a reasonable approximation of the artwork for Valdor. 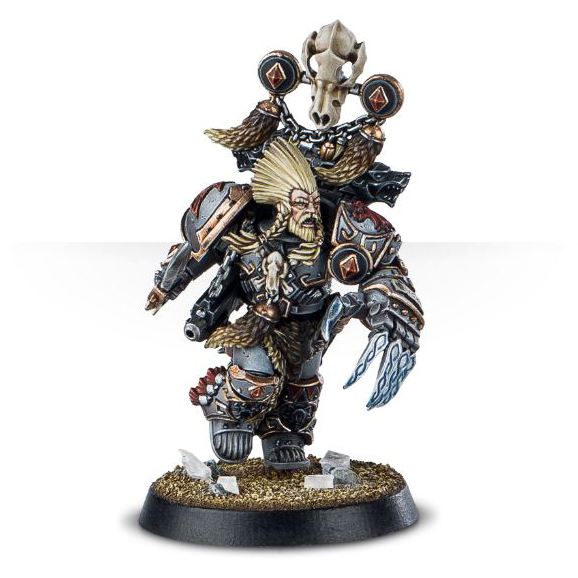 While most conversions have him running forward, however, this one is clearly more static, resembling his appearance in this piece of artwork. The model now looks quite a bit more massive than before, which I think is a rather nice fit for the slightly clunky, archaic looking armour on the upper body. The model’s nowhere near finished, of course: What you see above was only started yesterday afternoon, but I think I may be on to something here…? 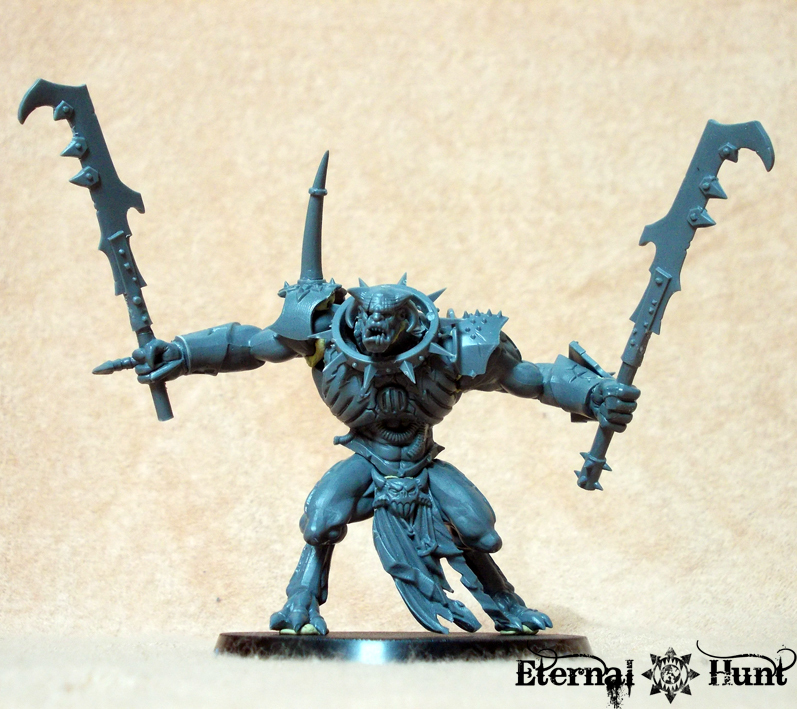 Anyway, so far for my current kitbashes — they really serve as a great way to relax for me, funnily enough, and as the one part of the hobby that I never seem to tire of. So, let me know whatever feedback or suggestions you might have in the comments! And, as always, thanks for looking and stay tuned for more! 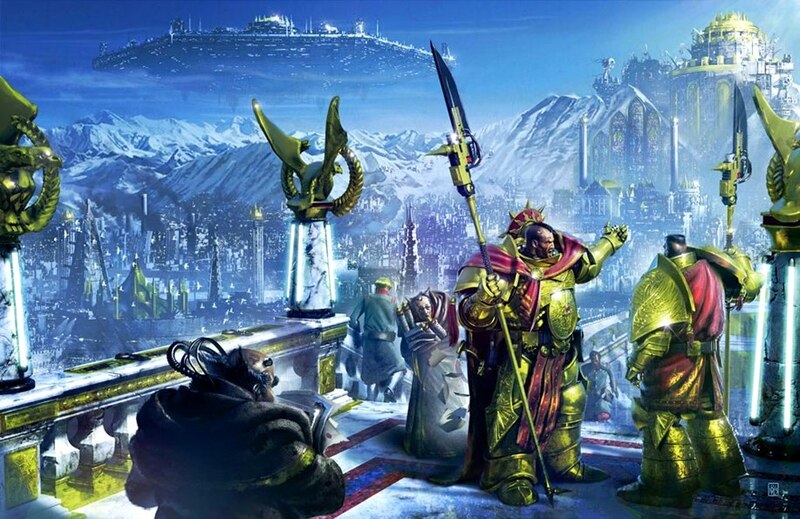 Legio Custodes – long time no see! 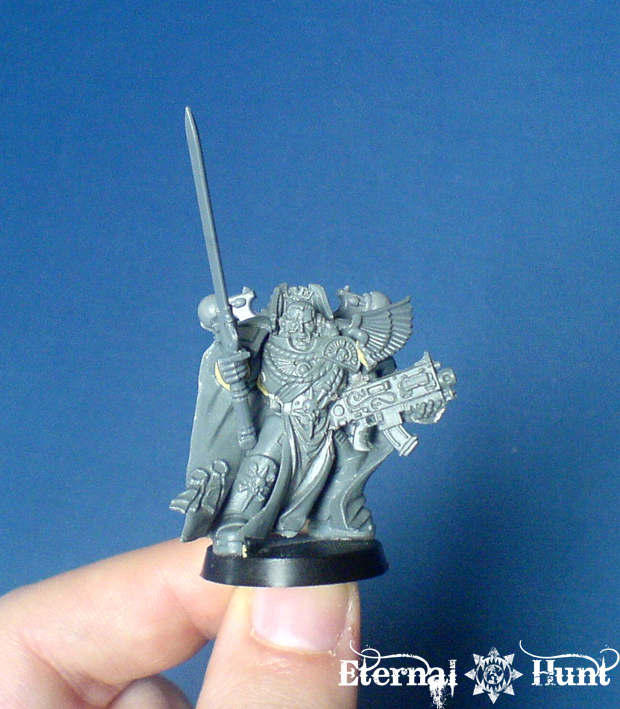 Using mostly Sanguinary Guard parts, this grizzled veteran looks like the hero he is. 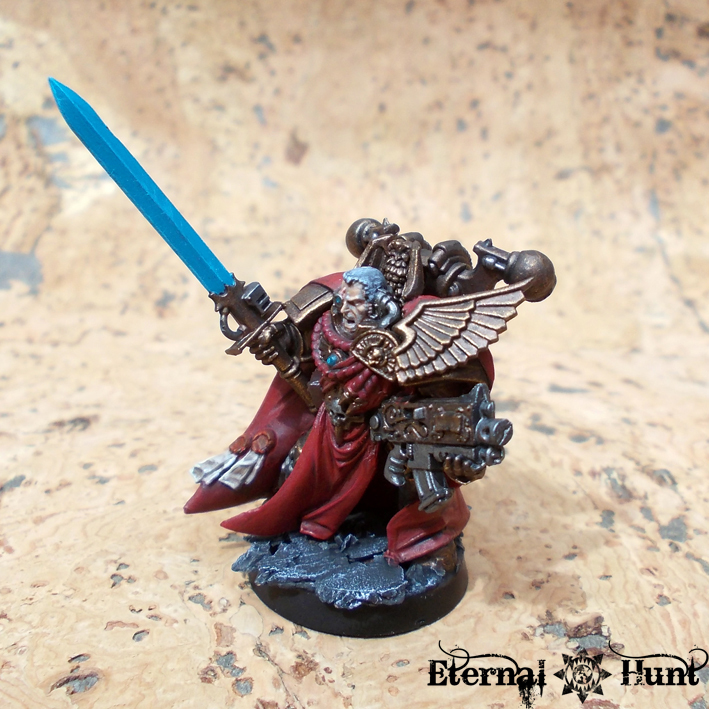 I added a CSM Plasma pistol as well as a company champion’s power sword to make the model’s equipment look especially ancient and well-crafted. The engravings are unfortunately the wrong way around, but there was really no easy way to fix this. I still like the overall effect, though. While these models had been built for quite a while already, I have now cleaned and assembled their jump packs, so they are very much next in line for painting. 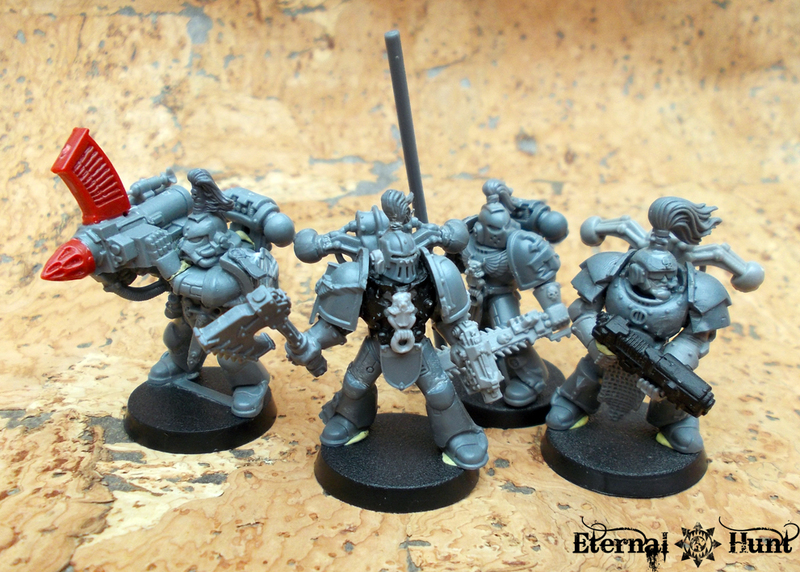 I also built some more models for Squad Asklepian, a unit of Custodians wearing older marks of Astartes power armour. 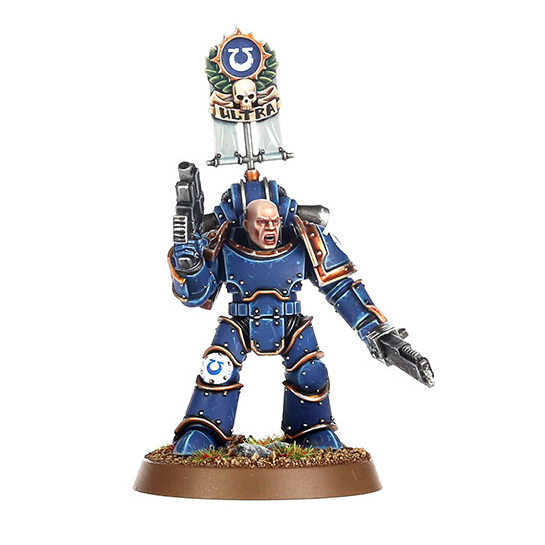 My goal was to have every armour pattern from Mk 1 to Mk 6 on display in the squad, while some additional models with suitably old and/or ostentatious looking armour were also drafted into the unit. I am still really pleased with the model, if I do say so myself. A small lion figurine was added to the custodian’s chest, thereby creating a winged lion ornament. I also added the bottom of a purity seal, used almost like a loincloth in this case. 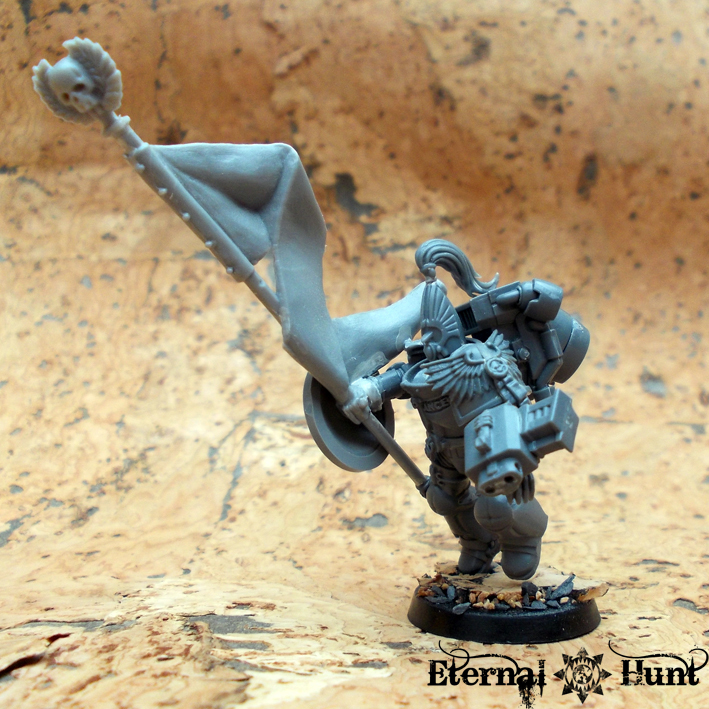 As you can see, the model will end up as the squad’s standard bearer. 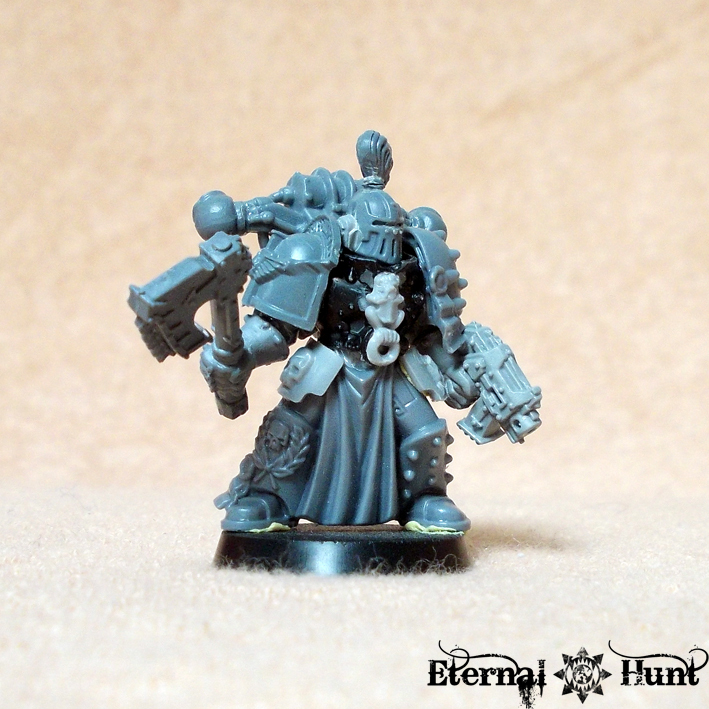 First of all, I just used the clunkiest bitz I could find for a more heavily armoured and less mobile look. 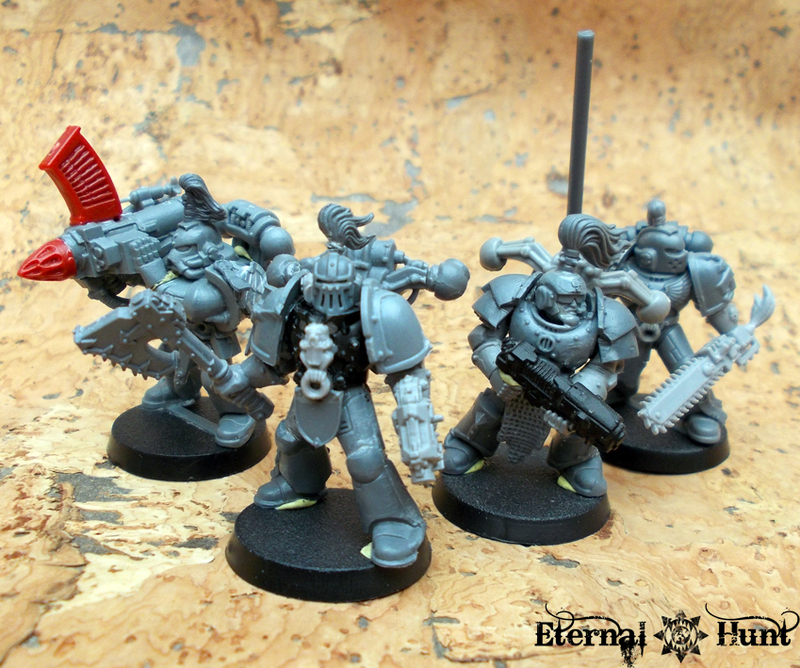 The weapons (taken from the Khorne Berzerker sprue) also look suitably clunky and pre-heresy. 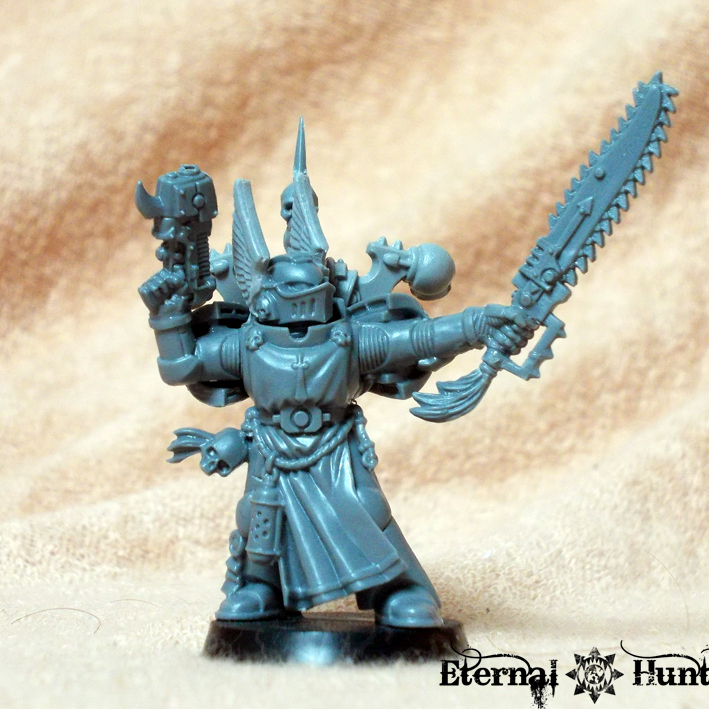 The most important part of the conversion is the head, though: It originally came from the WFB Skullcrushers: I had shaved off the Khornate bunny ears to use them on another model, and coincidentally realised that the helmet could work as a Mk. II with a little bit of work. So the eyeslits were carefully converted to a single, cyclopean slit, and the “ears” from a regular Marine helmet were added to the sides. It may not be a totally accurate representation of the armour design, but I am still pretty happy with it. 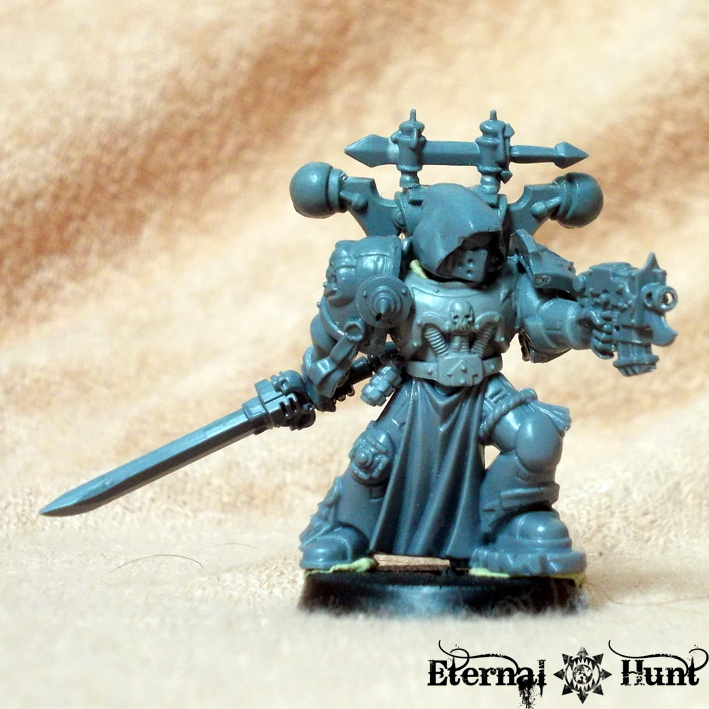 At least it manages to look pretty archaic, and this whole project was really never about perfect accuracy anyway, but rather about the joy of converting and kitbashing. 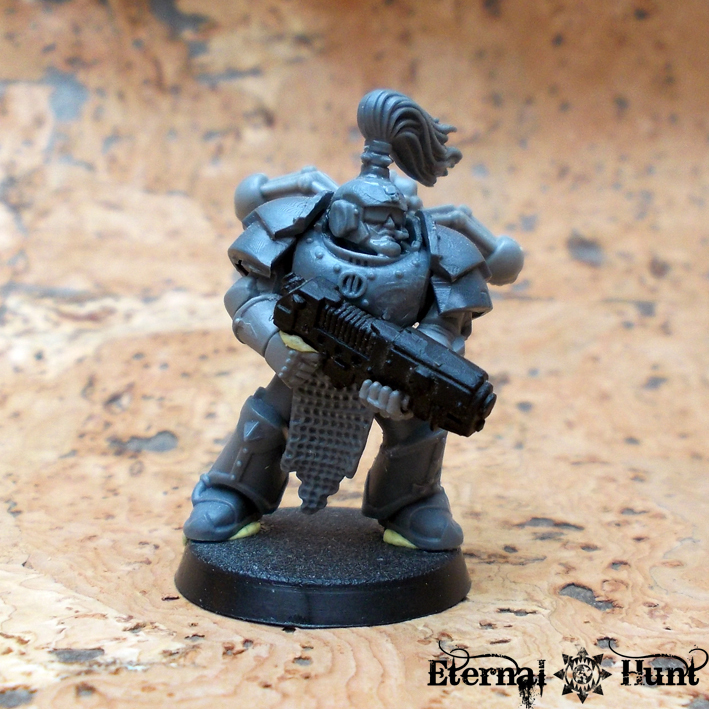 Lastly, I still had a Marine wielding a rocket launcher from the “Assault on Black Reach” boxed set knocking around, and seeing how his helmet had a nice, archaic look, I wanted to use him for squad Asklepian. 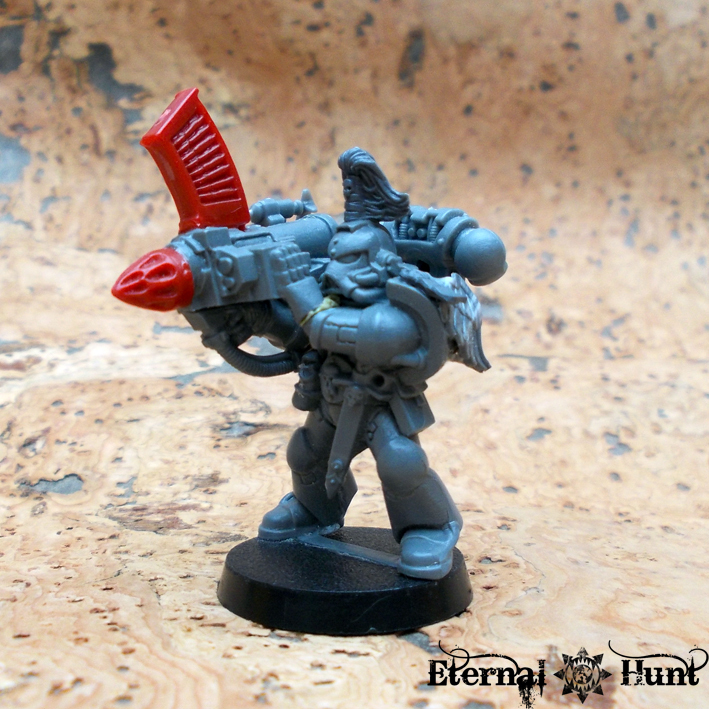 However, turning his 40k rocket launcher into a 30k one proved to be quite a headscratcher. So the model mouldered in my bitzbox for a long time. 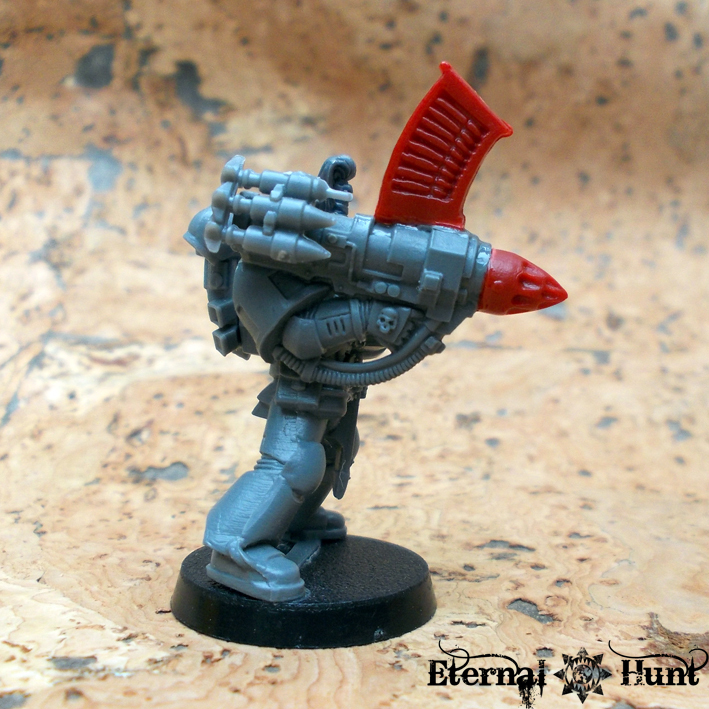 I was almost tempted to just get one of FW’s rocket launcher arms, but once again, only using plastic GW parts was part of the self-imposed restrictions for this project, so I had to find another way. 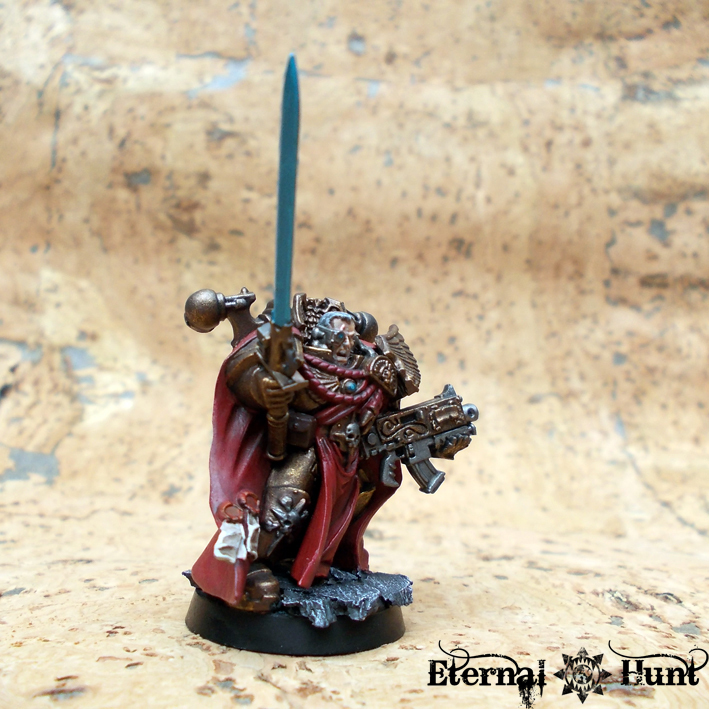 One of the good old Space Crusade weapons really helped me out here! 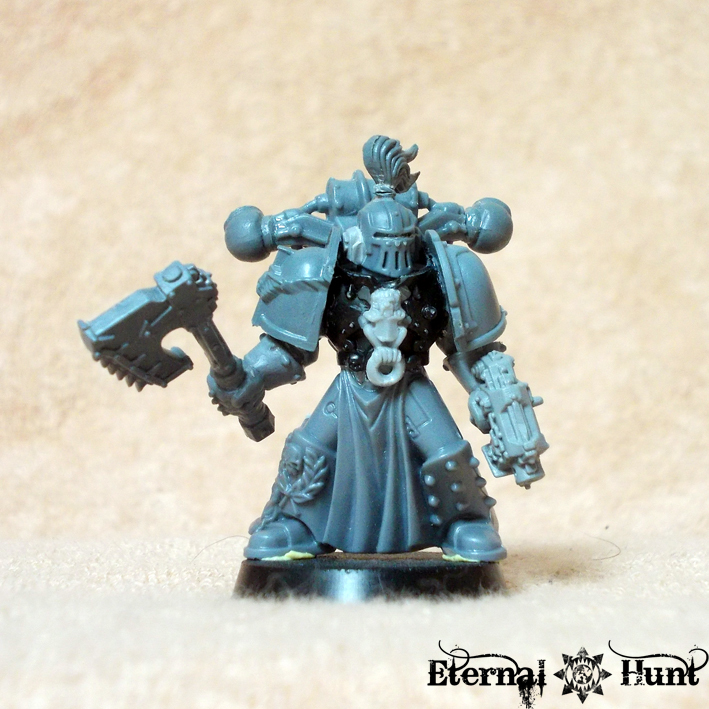 Granted, it’s far from perfect, but I think it’s a pretty reasonable approximation of the “official” FW stuff, given the rules I had set for myself. 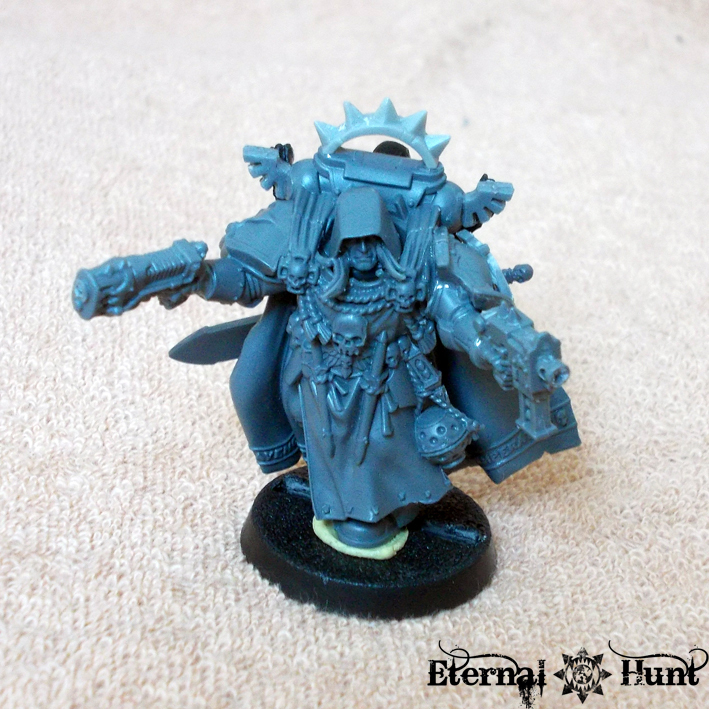 As a matter of fact, I am very much in love with this clever (at least for my standard) little conversion at the moment! 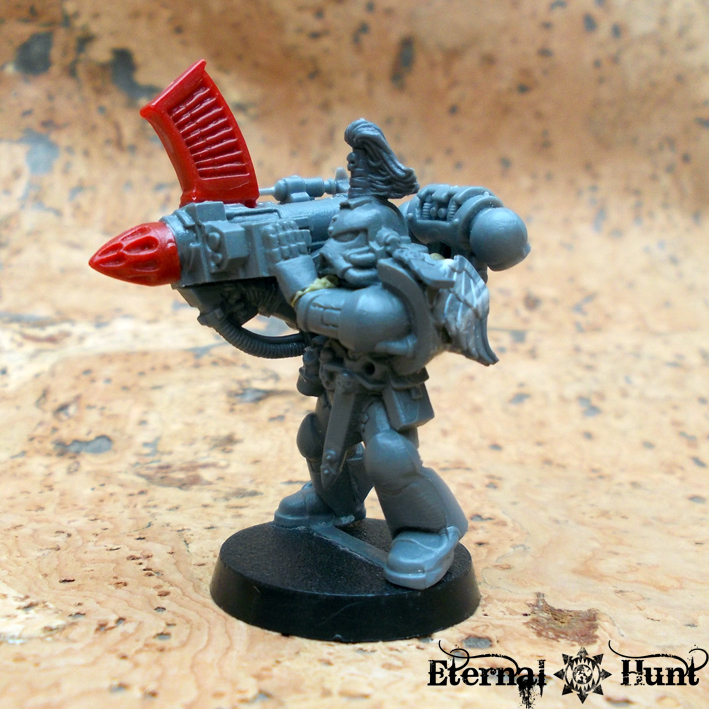 Of course I also added a topknot and an additional wing ornament to tie the model in with the rest of the squad. 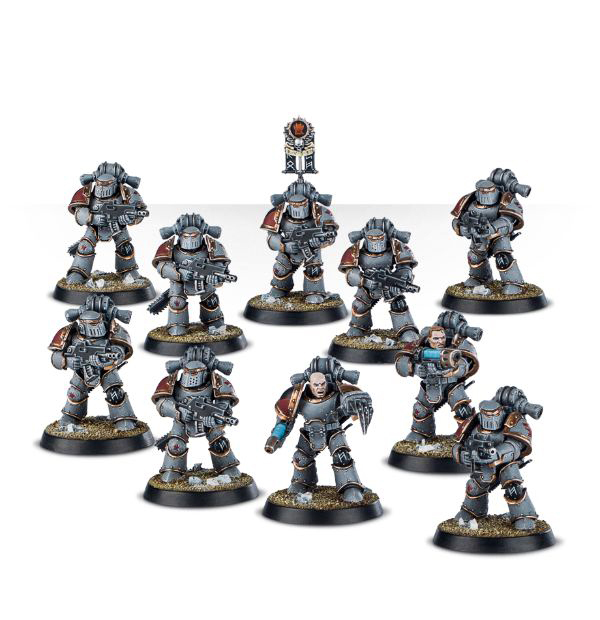 This brings the number of models in Squad Asklepian up to nine and means I only need to do a model in Mk IV “Maximus Armour” to complete the collection — fortunately, I already have all the plastic bitz I need for that last Custodian in the squad. Anyway, any and all C&C are always welcome! And, as always, thanks for looking and stay tuned for more! 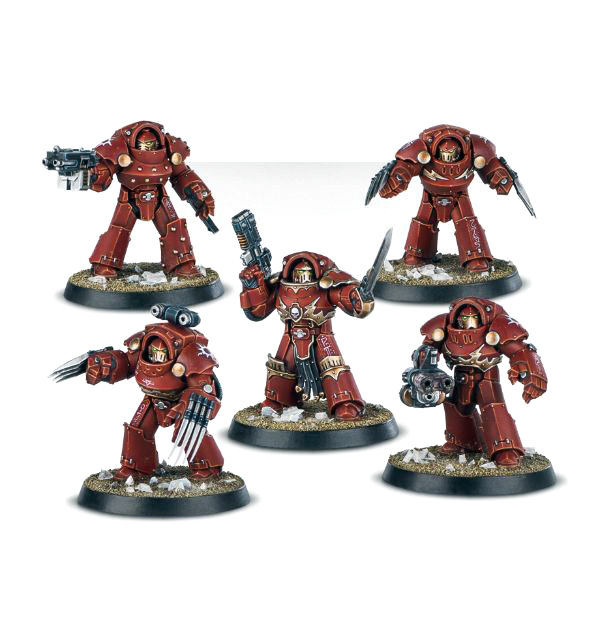 Originally, I had planned to build only one model as a proof of concept, but the Terminators that came with the Dark Vengeance box allowed me to bump the squad size up to five. 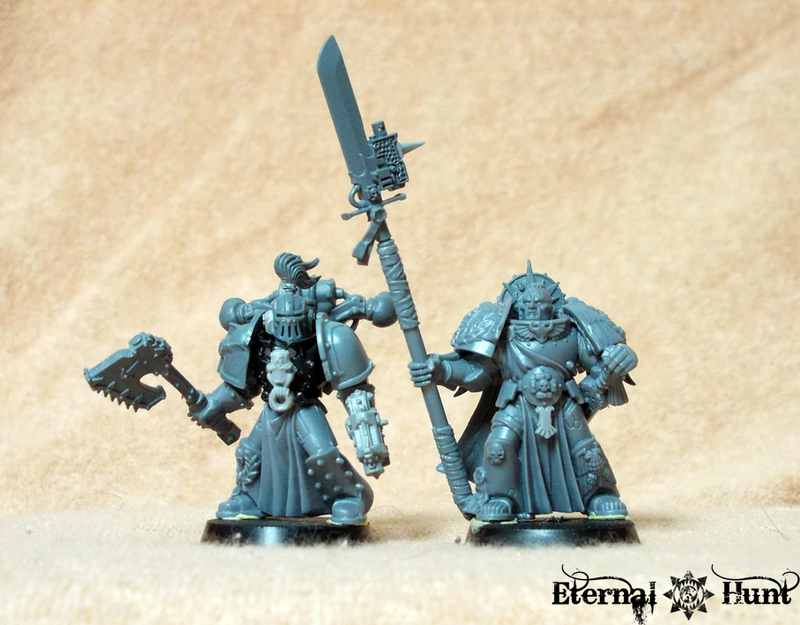 While these may look a little different from FW’s “official” Cataphractii model, they were kitbashed with base models and bitz I already owned anyway, and I think they read as Heresy-era Terminators well enough. 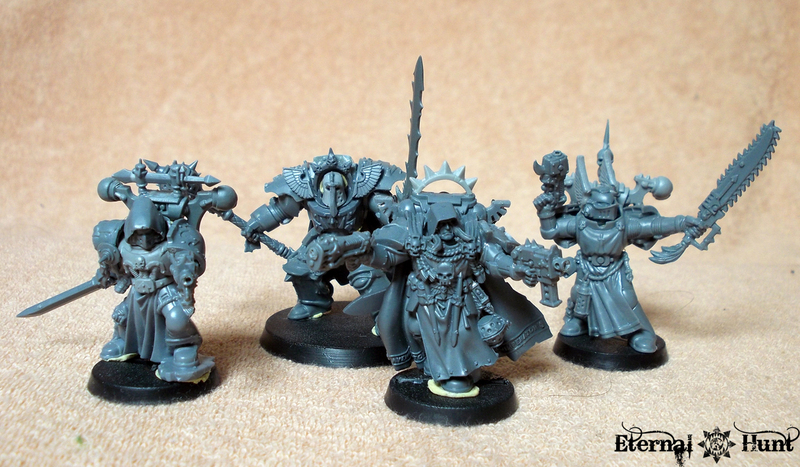 Still, five models should be enough for now, so the next step would be to actually get some colour on these guys. 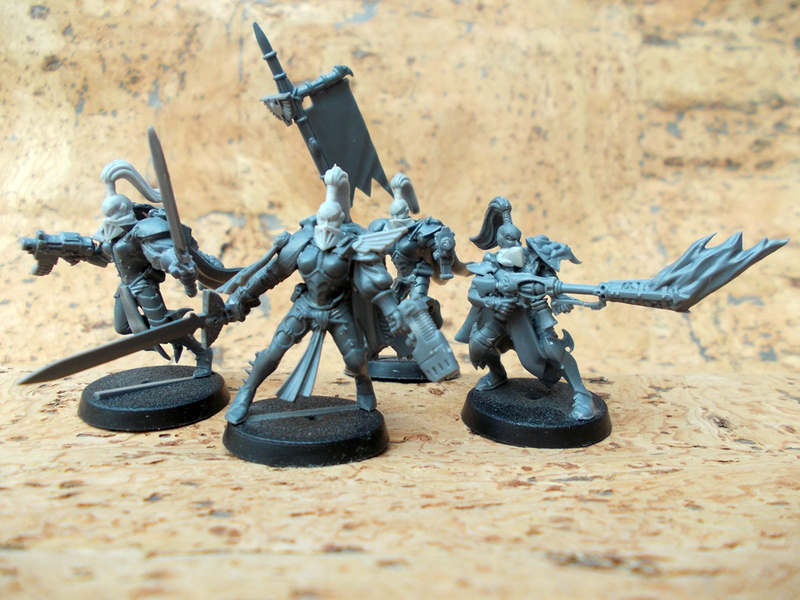 Another spur of the moment idea was to add a small squad of Sisters of Silence to the army. 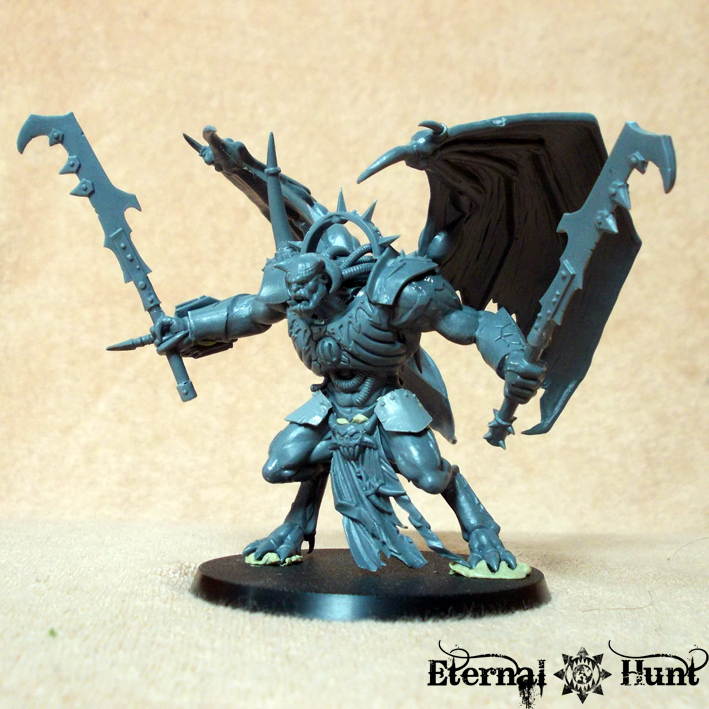 This was made pretty easy by the fact that some of the Dark Eldar models make for pretty convincing Sisters when combined with a couple of more imperial looking bitz. 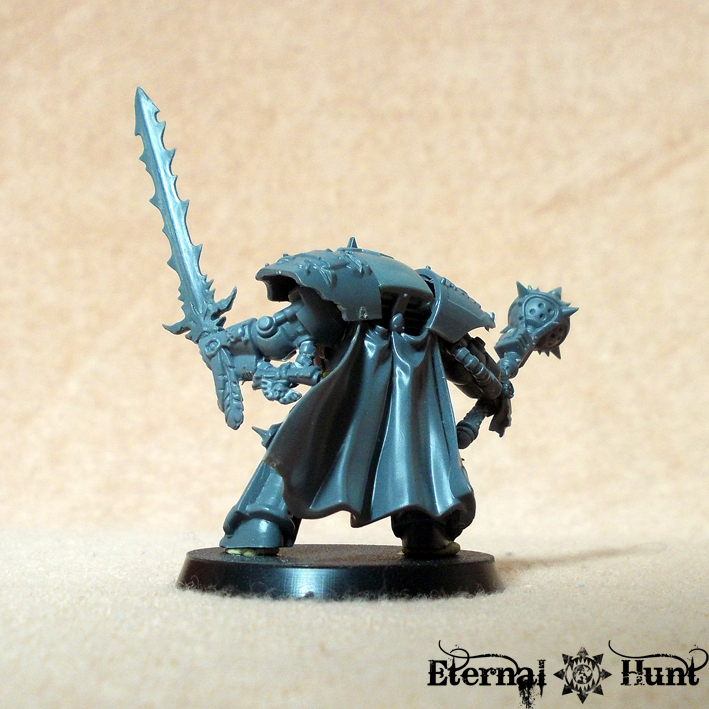 I thought it would be a cool idea have a model wielding a flamer in the squad, so I used a bit from the plastic Empire wizard kit and combined it with the body of a Dark Eldar shredder to create a flamer that looked suitably archaic and ornate (and was, once again, pretty close to the official HH artwork). 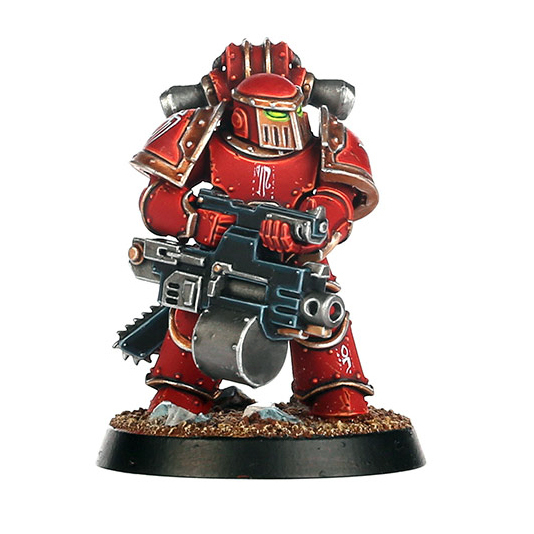 I think I’ll be adding one more model to make sure the squad is actually legally playable. 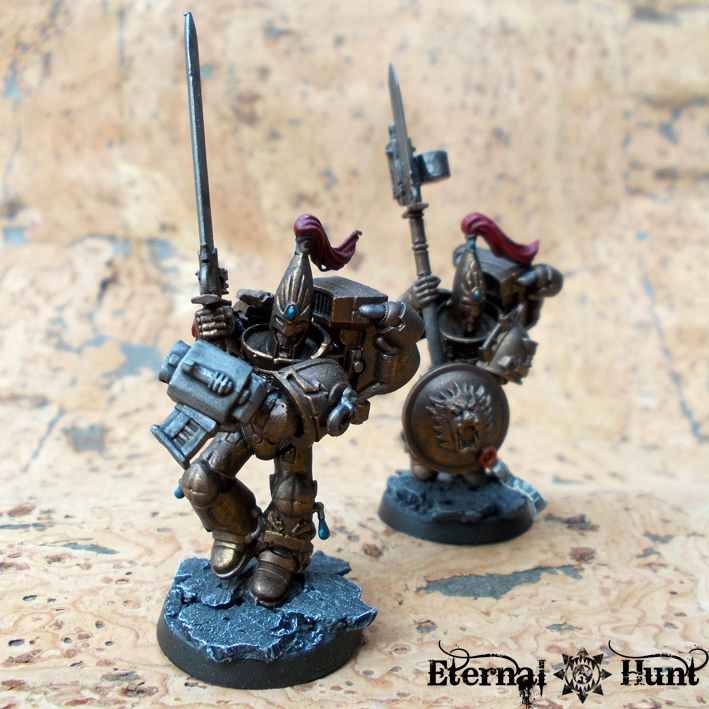 They could probably be used as Scouts, although that’s really not all that important to me. 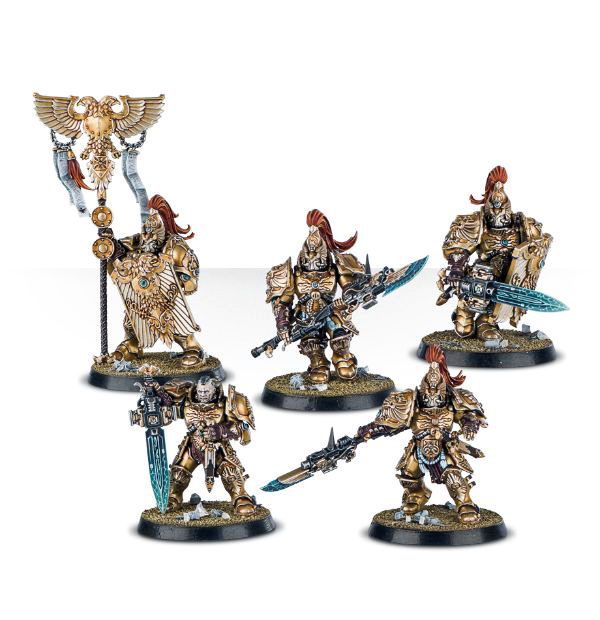 In any case, a squad of five will look nice enough, even if it’s just on a display board 😉 The one decision I still have to make is whether to paint these in gold (like the regular Custodes) or rather in a combination of red and silver (as they are seen in several pieces of HH artwork). 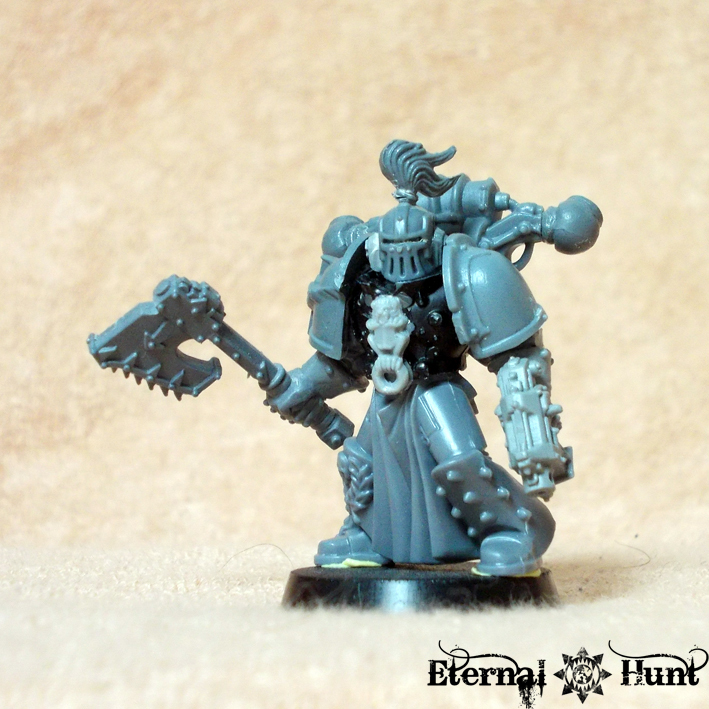 I combined all kinds of Marine parts with the legs of a WFB Warrior of Chaos. 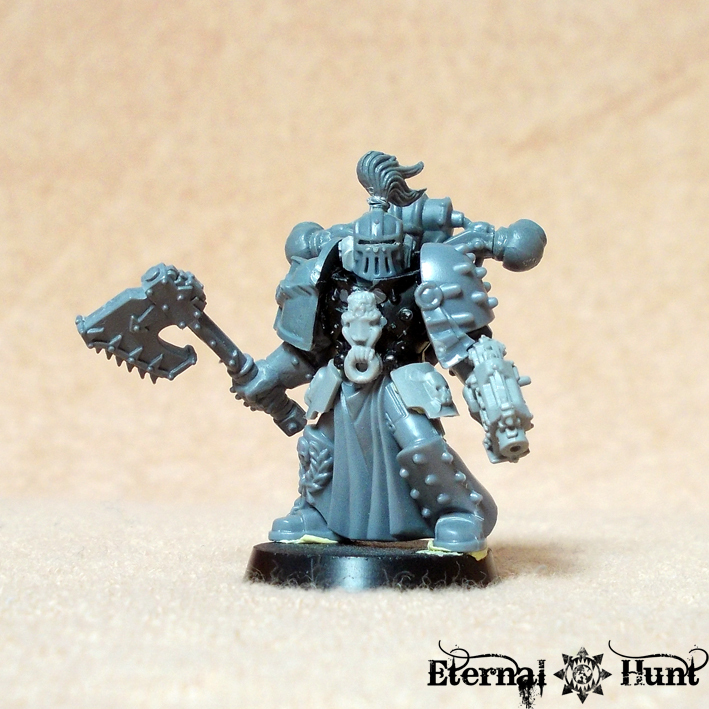 I also added a slightly converted Thunder Hammer. 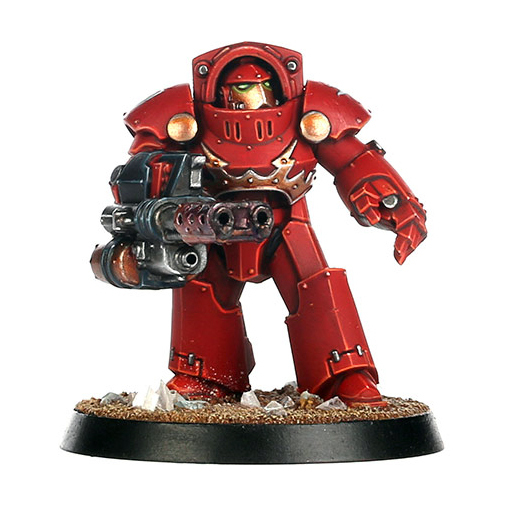 The storm bolter looks a little too clunky, so maybe I’ll just swap it for a storm shield. 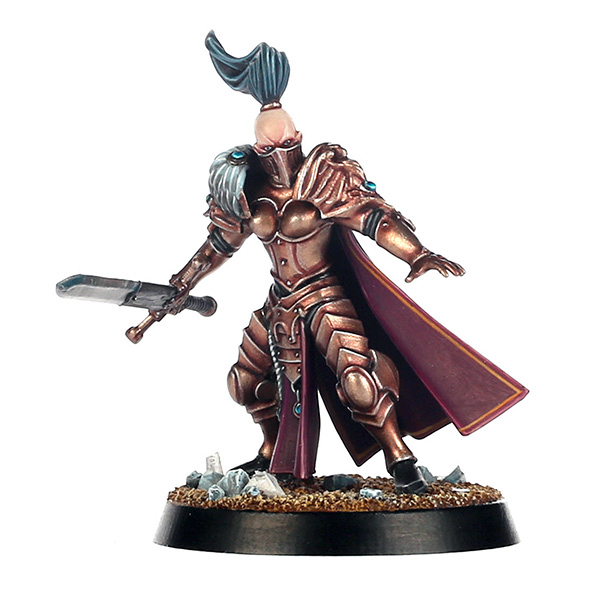 And I have to be honest with you: The whole model was really heavily inspired by one of the very nice Custodes models over at The Buddy Times (I really wish Hashashin would get back to building more Custodes!). 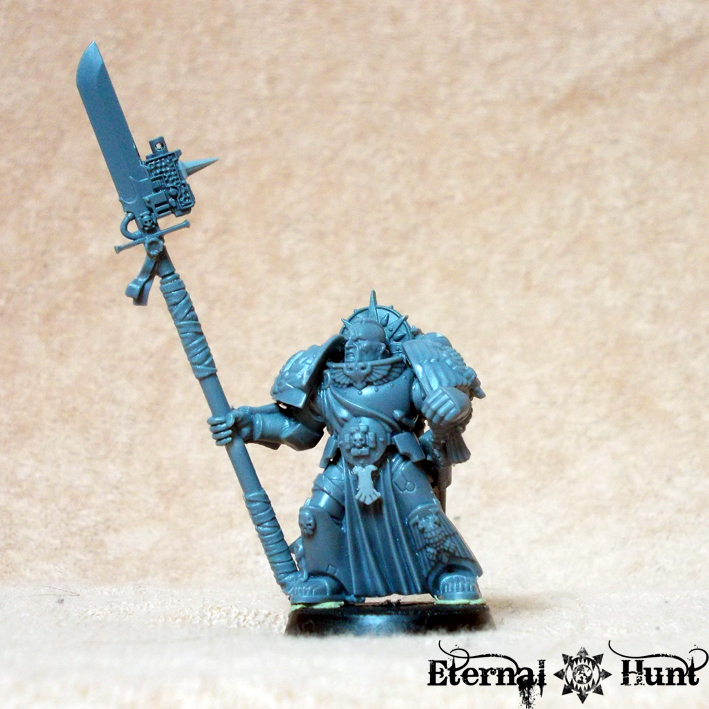 This one is a bit closer to the classic Custodes look, wielding yet another converted judgement spear. 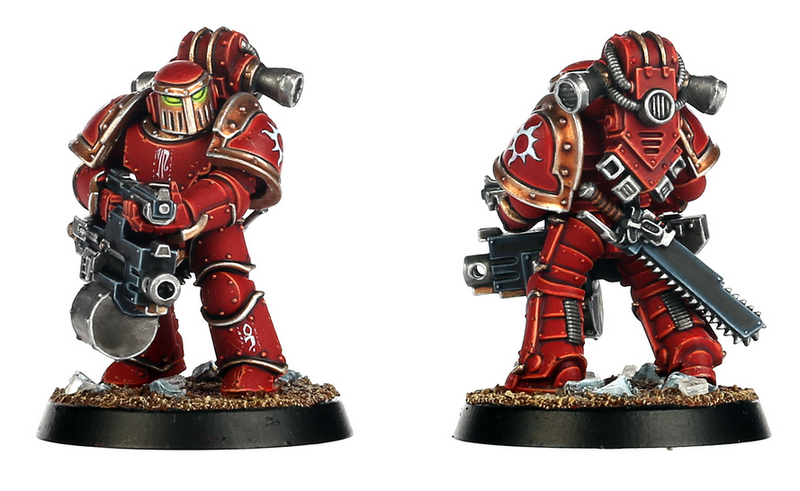 Apart from the two painted test models, there are three more in the squad. 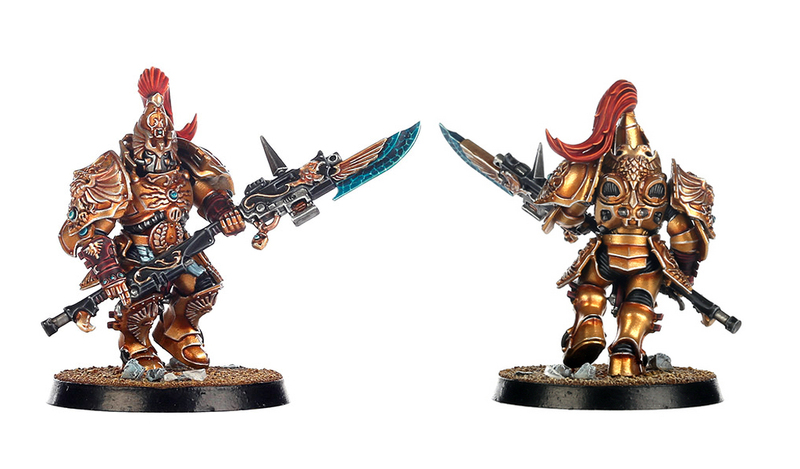 I’ll probably paint these next, so expect them to be the next update concerning my Custodes army. 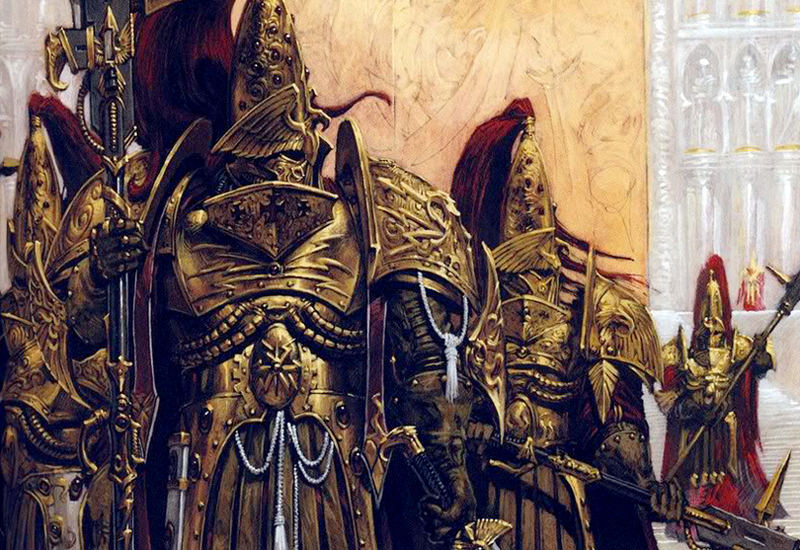 Anyway, these are my Custodes-related projects at the moment. 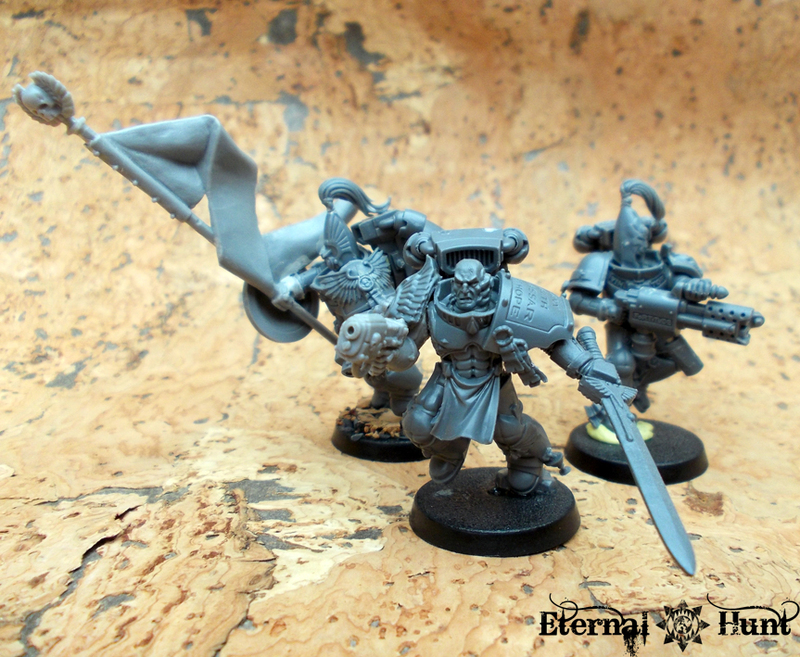 All in all, the army remains a fun project to distract me from all the World Eaters stuff. Plus it offers me the way of using all the strange and obscure Marine bitz that end up in my bitzbox in new and interesting ways. I’ve been doing very little painting for a while. Maybe it’s because these last few weeks have been rather stressful, maybe it’s the weather, but somehow I just didn’t feel all that inspired to paint. 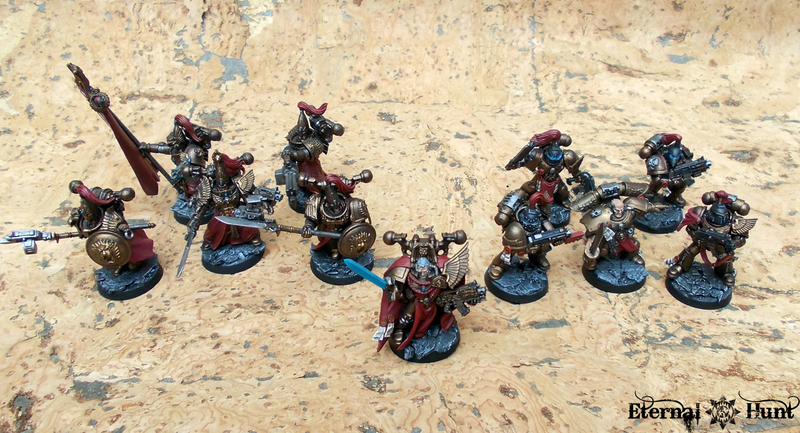 On the other hand, this means I had more time for a couple of conversion projects, so I sat down to build some new recruits for my small Legio Custodes force. 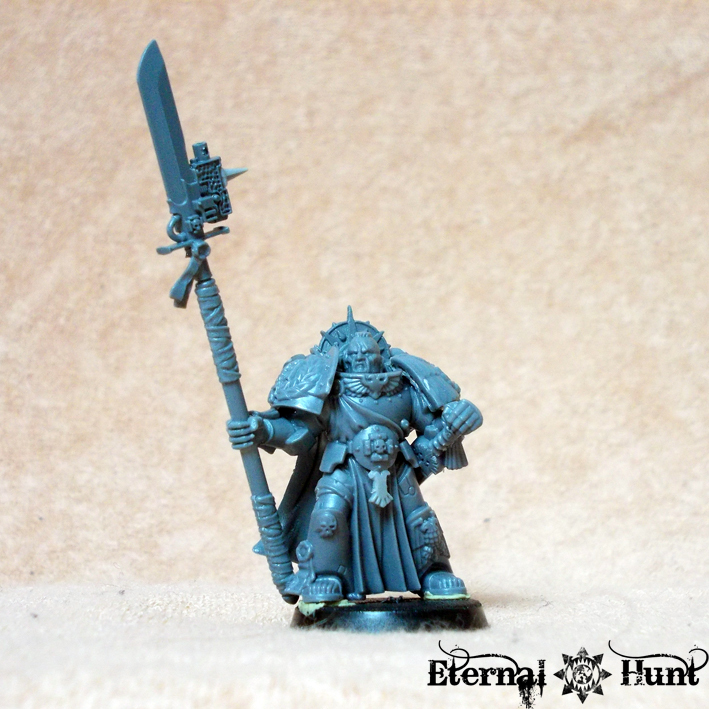 Kitbashing more Custodes is always really relaxing, because even though the goal I set for myself is rather special (make it look at least reasonably close to the official artwork while only using readily available GW plastic parts), it’s really all about creativity: I love to find out how all those Marine parts can be recombined and altered to make them look like something the Legio Custodes would be equipped with. 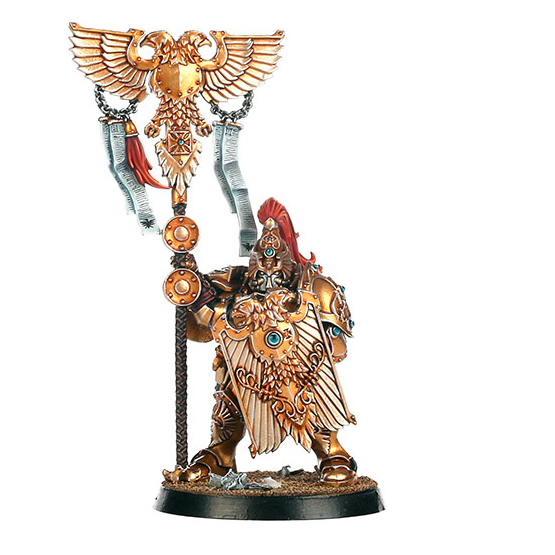 Plus the very ornate look of the Custodes means I really get to go all out on those models! So what do I have to show for my troubles? 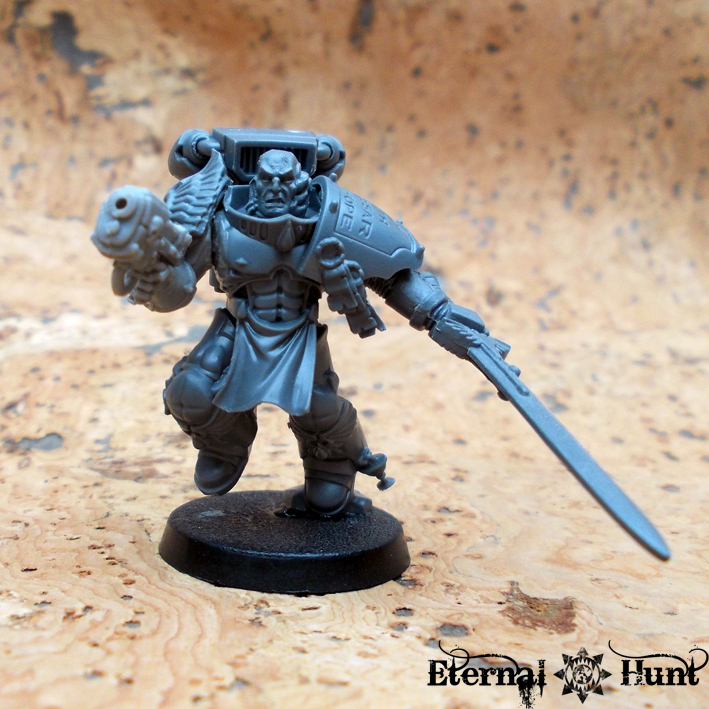 The left arm of the original model was cut off and replaced with a Chaos Terminator power fist. 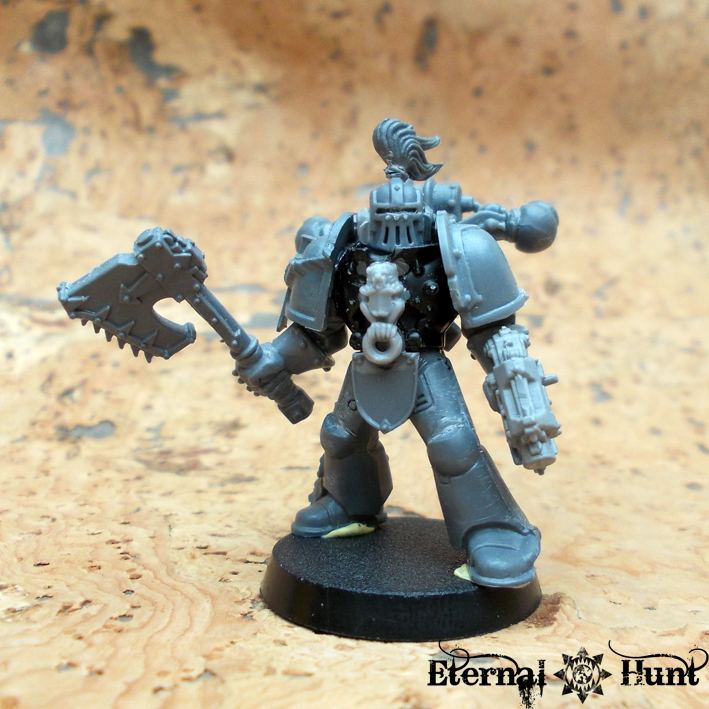 The DA torso front went into the bitzbox, and I used some (Chaos) Space Marine parts to construct a replacement. 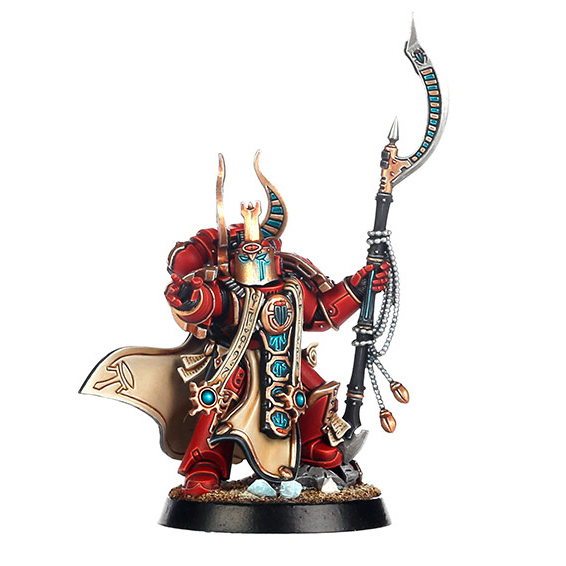 As you can see, I decided to equip this guy with a flamer, although I wanted the weapon to look a bit more like one of the “flame lances” Custodes Terminators are equipped with in some of the artwork. 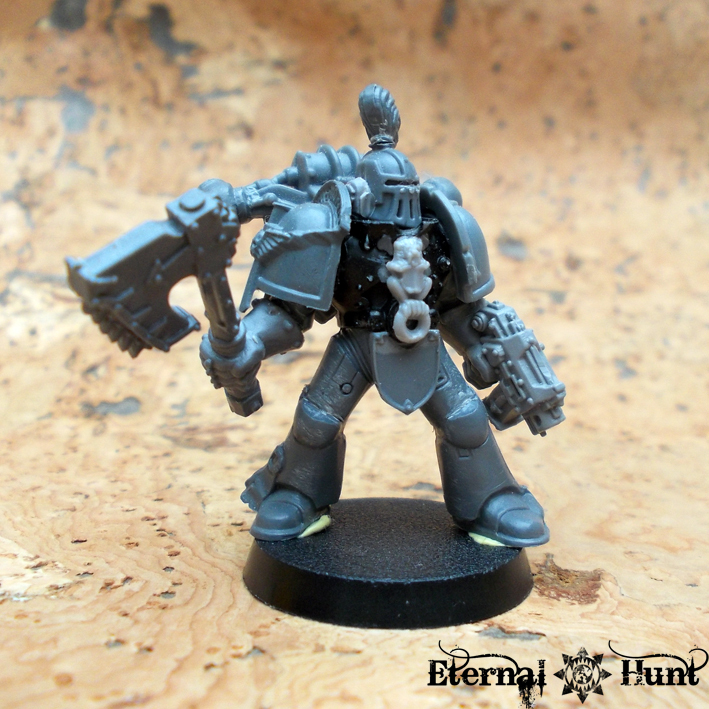 So I took a heavy flamer (from the Space Wolves terminators, no less), adding all kinds of bitz for decoration and lenghtening the weapon’s barrels with some plastic pipes from an old model truck kit. 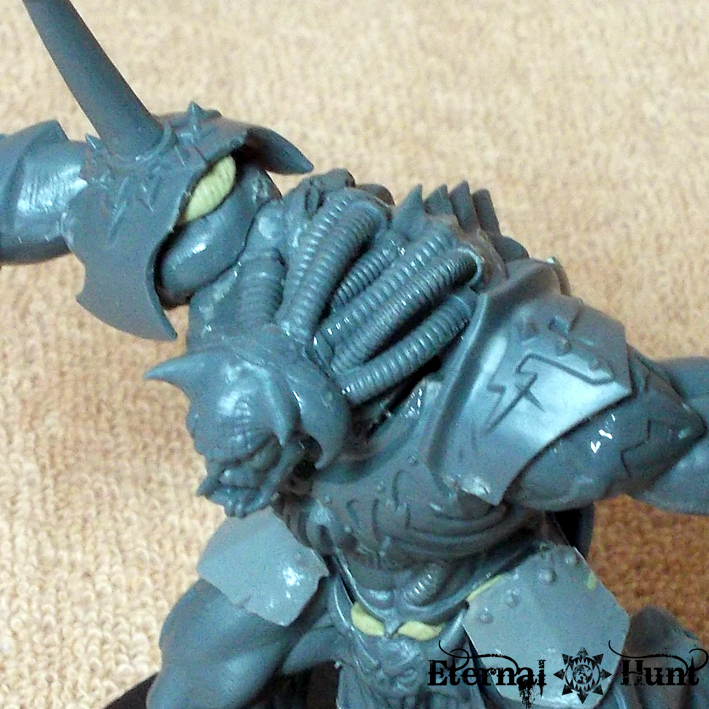 The muzzle was further detailed by adding a stylised eagle’s head (from the High Elf Archers). 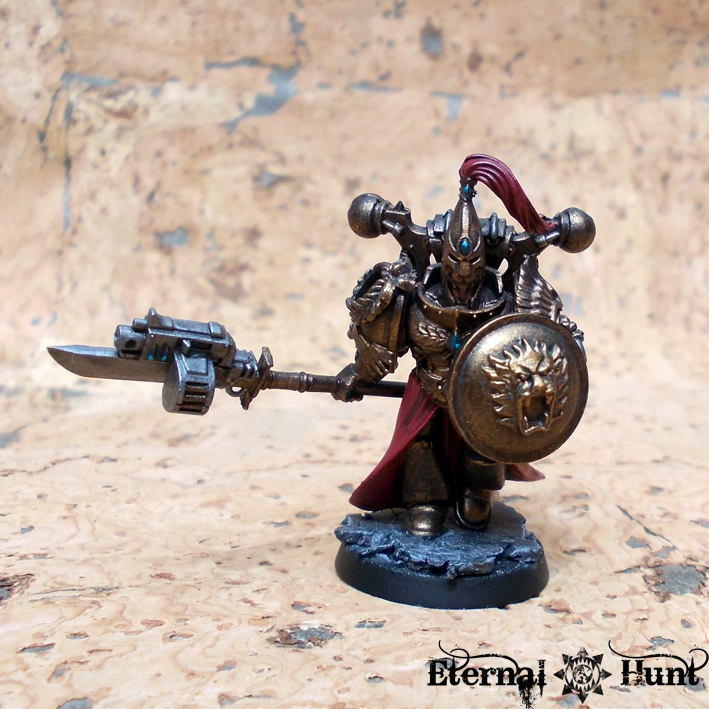 The overall idea for this conversion was once again inspired by Kaaleb Dark’s Custodes over on B&C, btw (he’s been posting new stuff too, so I recommend you check out his thread as well!). 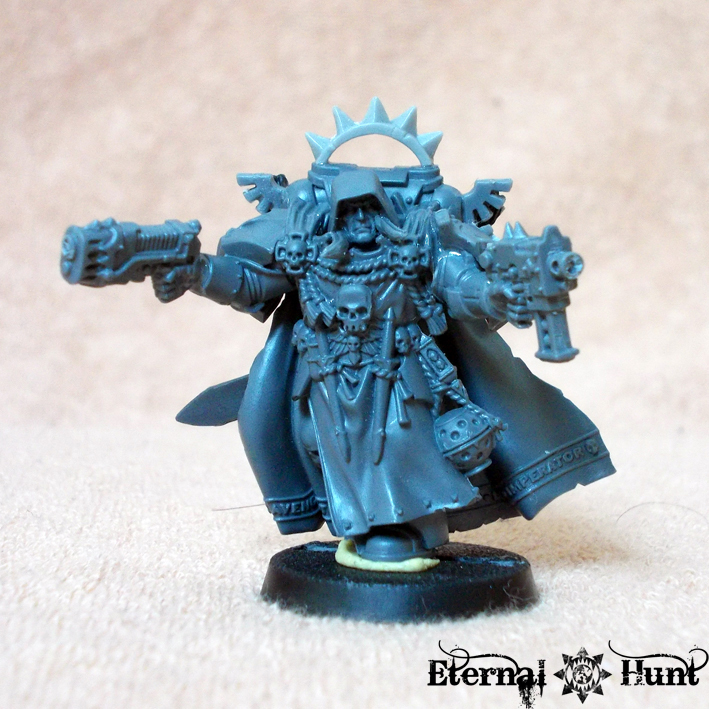 I already posted this guy some time ago: The model is based on the DA with Plasmagun from Dark Vengeance. 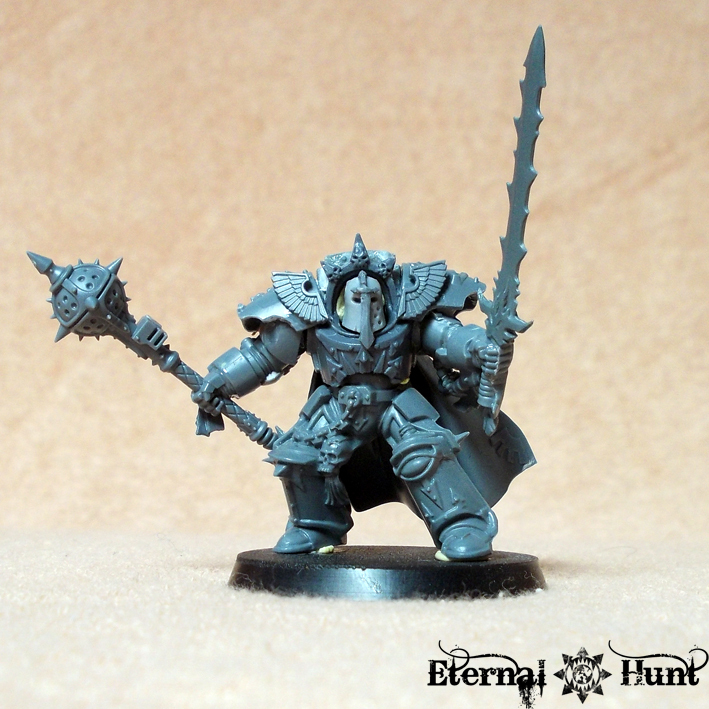 I used the model to build a Custodes standard bearer in older looking power armour. I may have to add some additional “bling” for decoration, though. 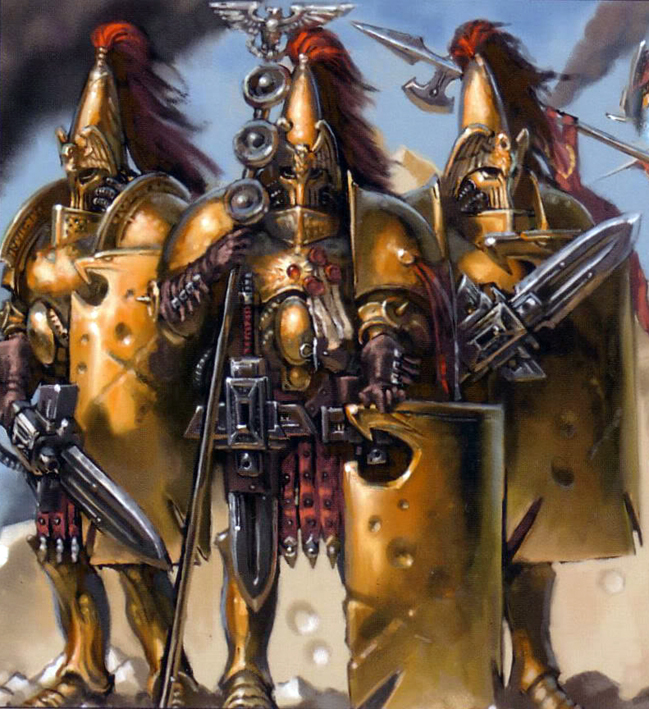 A Custodes wearing Mk I “Thunder” armour. 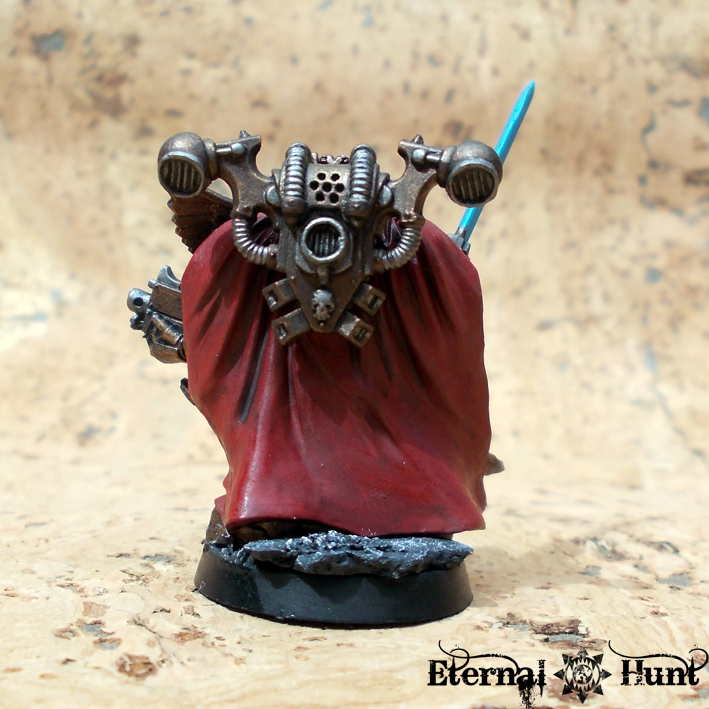 I got the idea for the model from Mywargame.com‘s fantastic turtorials for converting Pre Heresy armour. 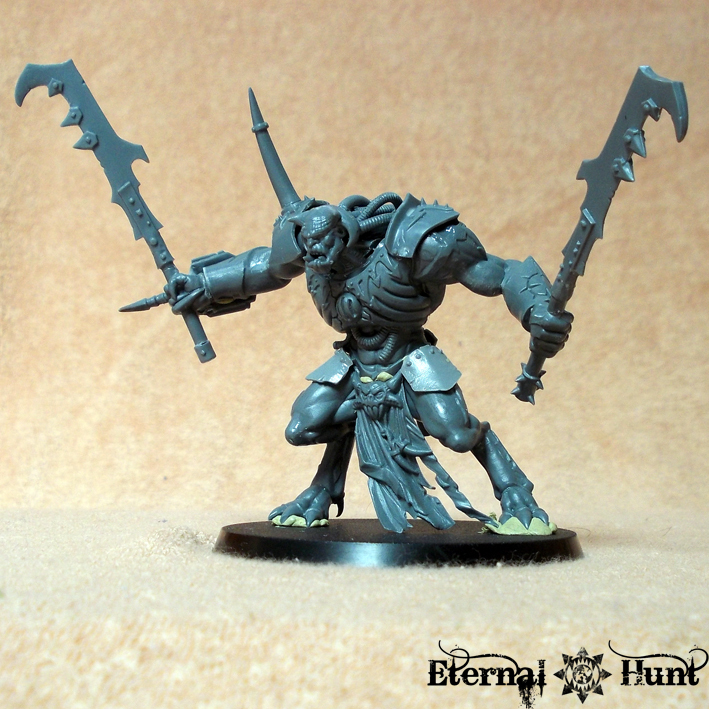 The base model is a Dark Eldar Wych: The legs and most female torsi from that kit are perfect for Sisters of Silence, since they look almost exactly like the artwork in the HH artbooks. 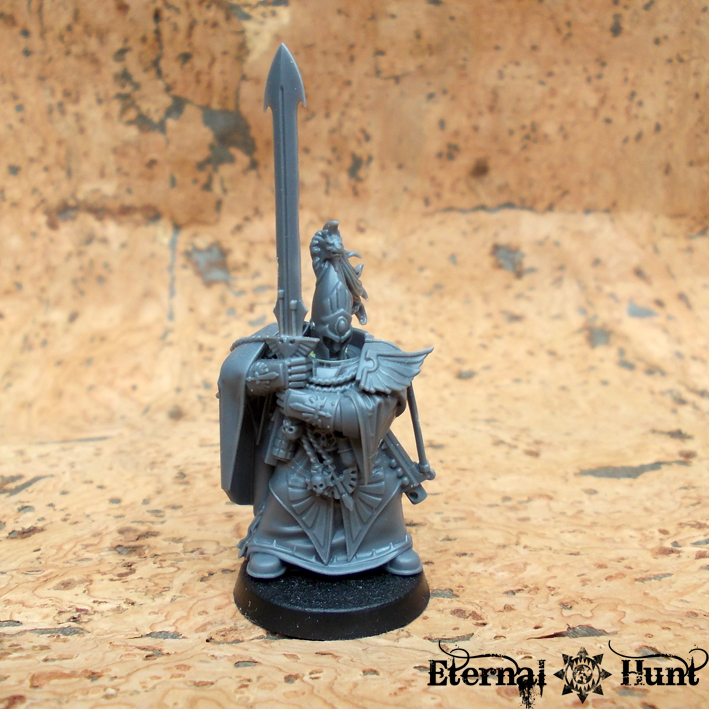 If you’re going to convert your own Sisters, you also want to look for arms with puffy sleeves — but there are enough kits with useful bits (the High Elf Archers and some WFB Empire kits are great for this!). 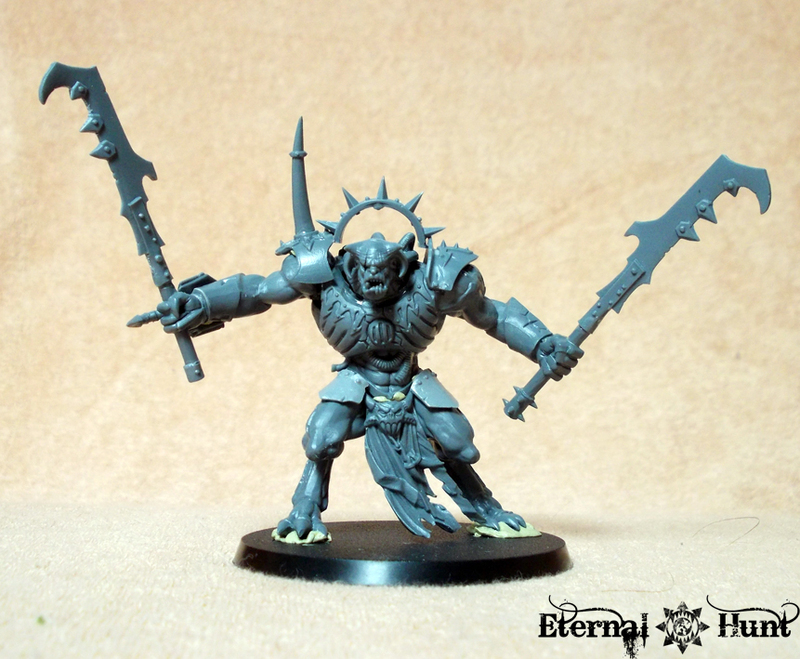 And you can splice together almost perfect heads using really old plastic Dark Eldar heads. 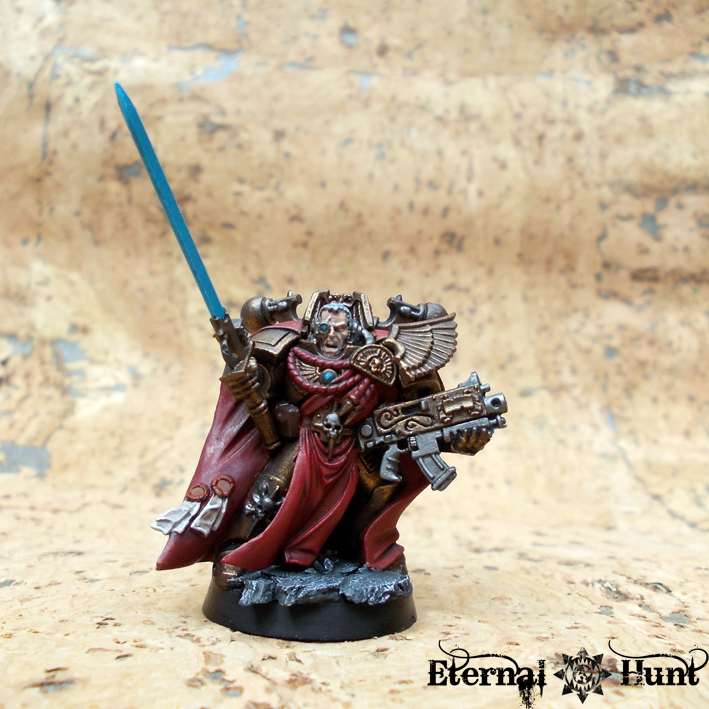 The standard is yet another part from the High Elf Archers, although I modified it a bit to better fit the artwork (and added a Dark Eldar back banner and an Imperial aquila). 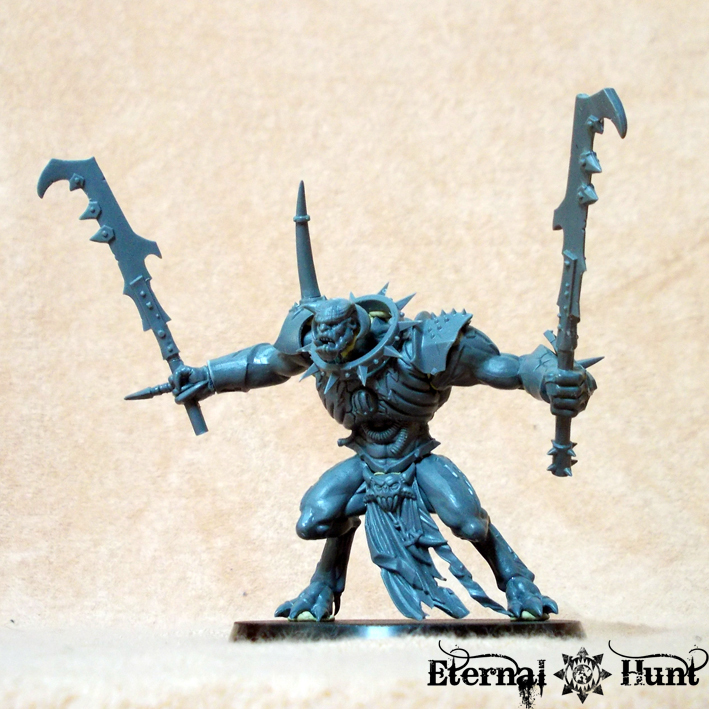 Again, the model is basically a Dark Eldar Wych with all kinds of bits added on top: I wanted her to look a bit more imosing than her squadmates, so I added a suitably impressive sword and a cloak (which I got in a bitz trade, so I can only guess that it might be from the High Elf White Lions kit). I am really quite pleased with her, to tell you the truth. 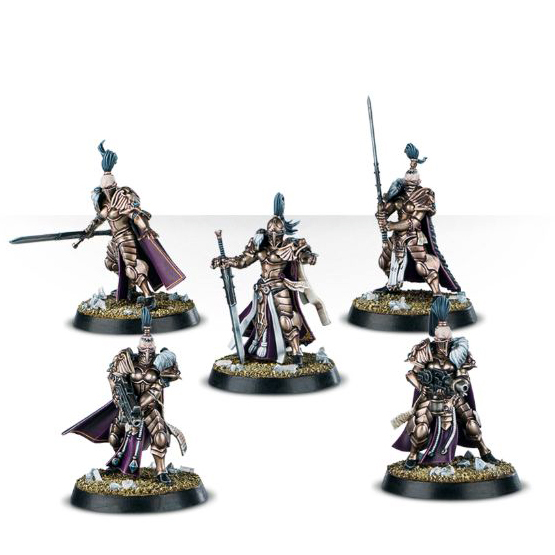 The only downside to these is that they require a prettty diverse assortment of bits, some of them (the old Dark Eldar heads) no longer readily available. Still, I think the results are rather convincing. 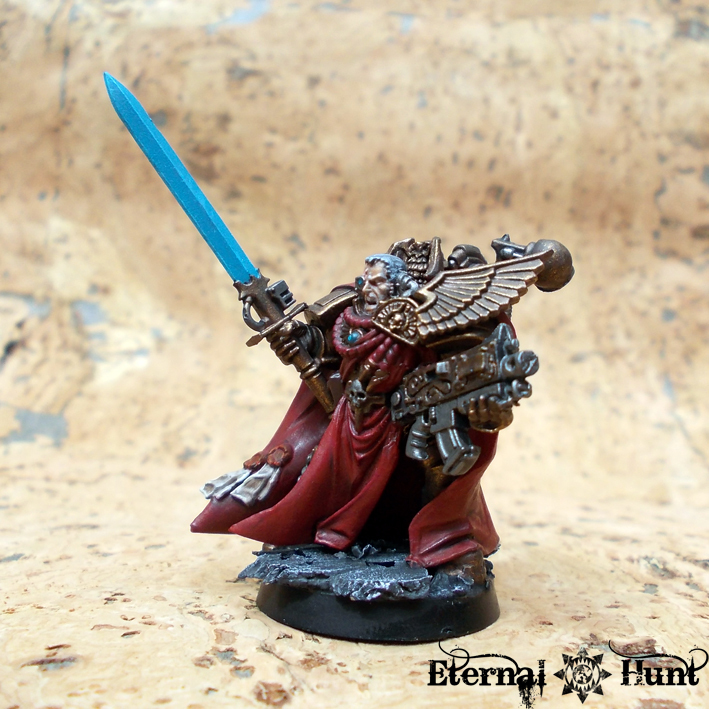 With two squads of Custodes completed, I decided it was time to add a commander to lead them into battle. 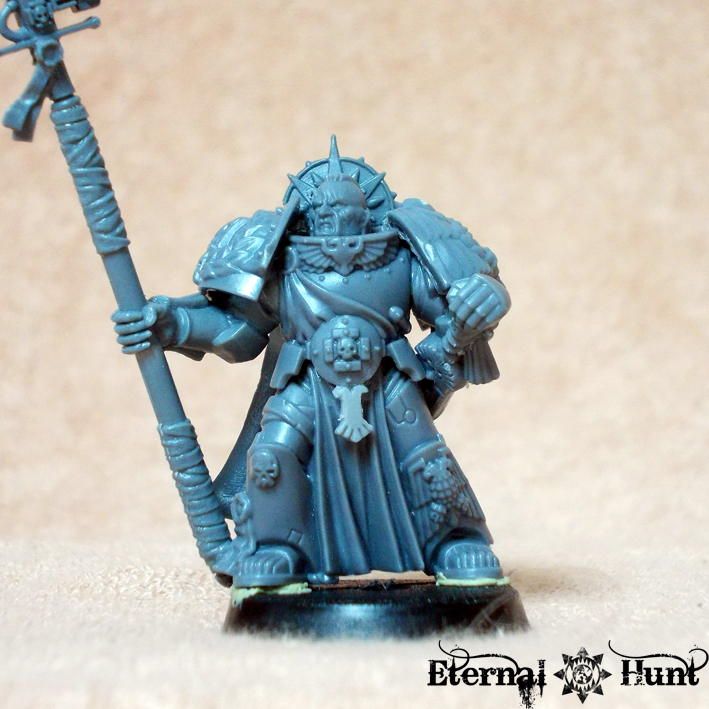 I really enjoy building characters for my armies, and the Custodes with their extremely ornate armour lend themselves rather nicely to converting impressive commanders. However, I decided to start with something pretty straightforward. 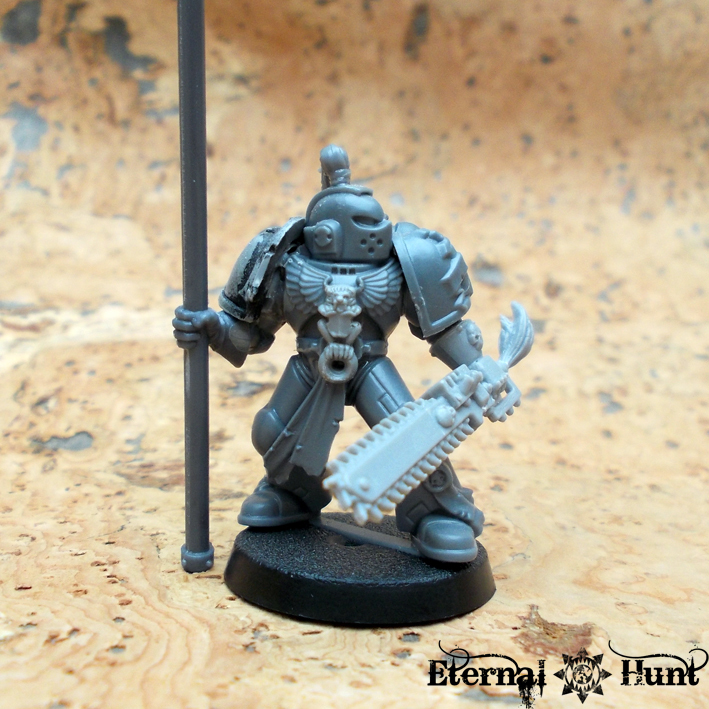 The model is a very easy conversion, if you can call it a conversion at all: I just added a different sword (from the Grey Knights in power armour), a CSM backpack and a wing from the Dark Angels veteran sprue. 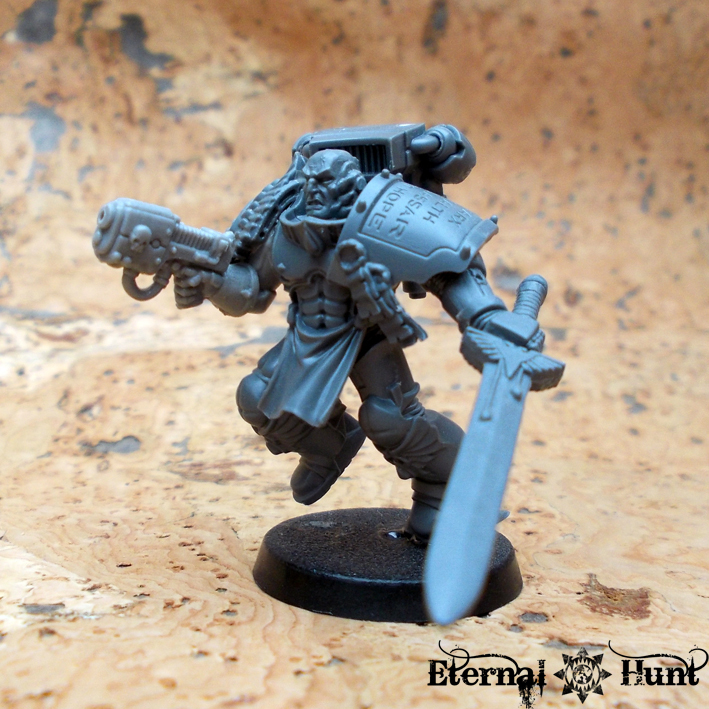 I did consider changing the head and/or Bolter for a while, but unfortunately the model had a few rough spots, probably due to a casting mishap, so going all out on the conversion would have created all kinds of new problems. Still, I am quite pleased with the model’s composition, so I was okay with basically leaving it as it was. 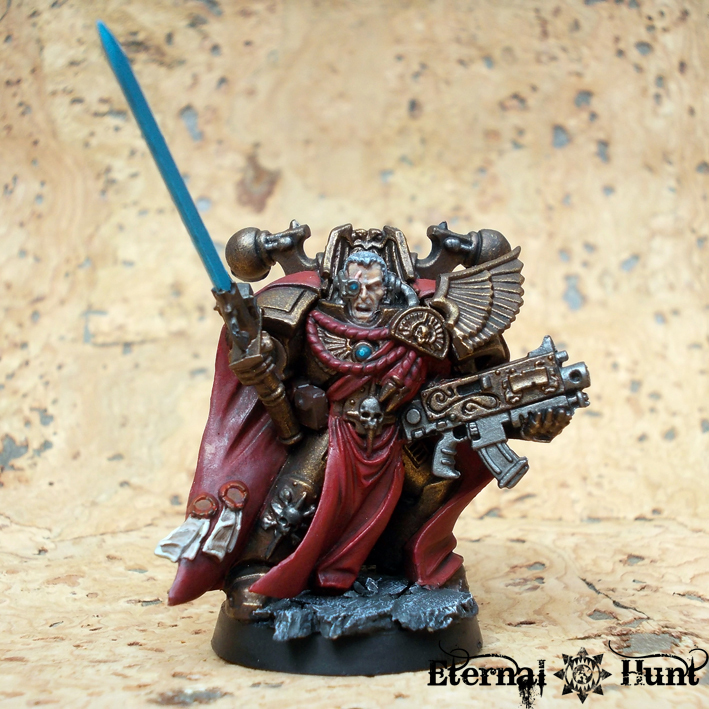 One of the commanding officers of the Lionsguard, Fennias Andronicus is a veteran of the Legio Custodes: Many are his honorary titles and names, and they cover every inch of the inside of his master crafted armour. 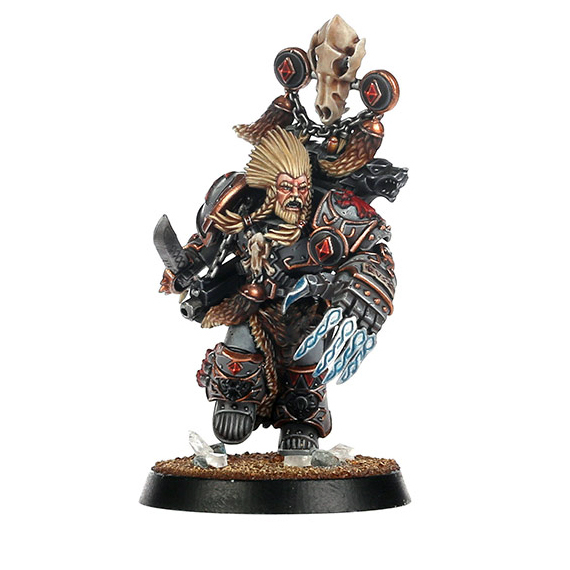 Called “The Old Lion”, Shield Captain Andronicus’ age and experience make him a skilled and levelheaded tactician, yet his name is also synonymous with heroism and prowess in combat. 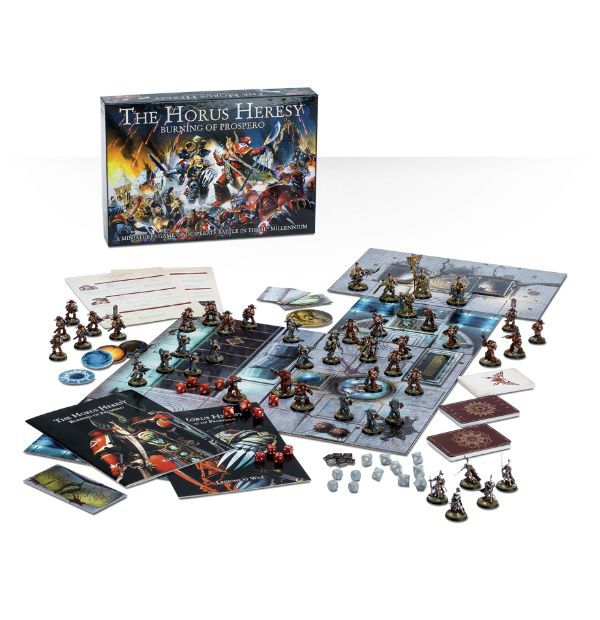 When the Legio has to face an enemy on the field of battle, Andronicus leads from the front, relic blade in hand, and becomes and instrument of the Emperor’s wrath.